The first historical account of walnut cultivation dates back to Babylon (now Iraq) circa 2000 B.C. The English walnut originated in the regions surrounding the Caspian Sea, hence it is known as the Persian walnut. In the 4th century AD, the ancient Romans introduced the walnut into many European countries where it has been grown since. 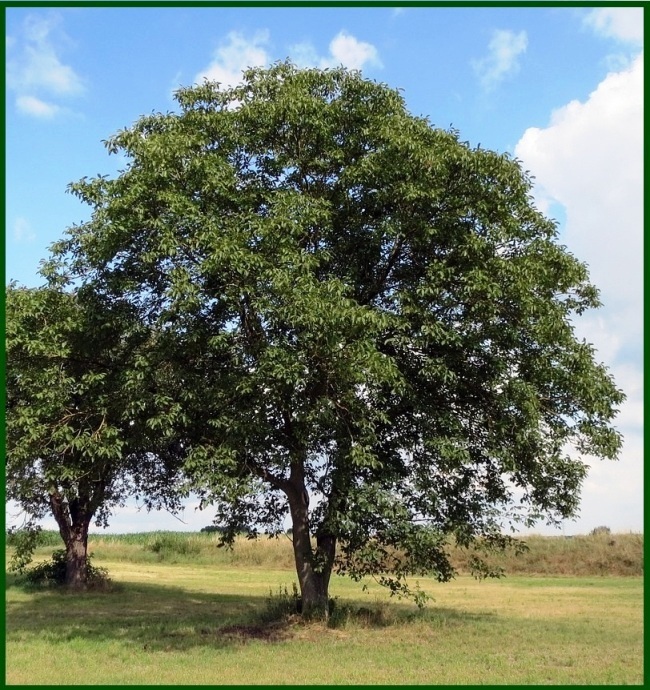 Throughout its history, the walnut tree has been highly revered; not only does it have a life span that is several times that of humans, but its uses include food, medicine, shelter, dye and lamp oil. It is thought that the walnuts grown in North America gained the name “English walnuts,” because they were introduced into America during the early 1800s via English merchant ships. Walnuts are edible seeds from the trees of Juglans genus. They are round, single-seeded fruits of the walnut tree. The fruit and seed of walnut are enclosed in a thick, inedible husk. The shell of the fruit that encloses the kernel is hard and is two-halved. 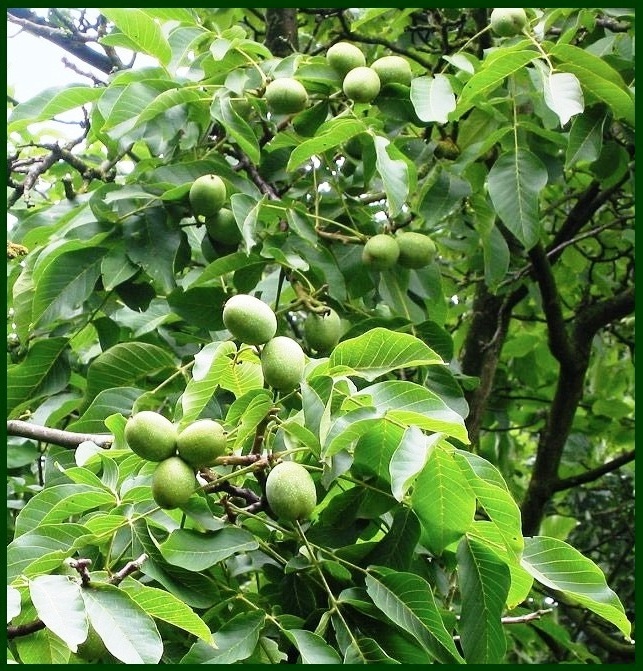 The walnut tree can grow up to 130 feet (40 meters) high. 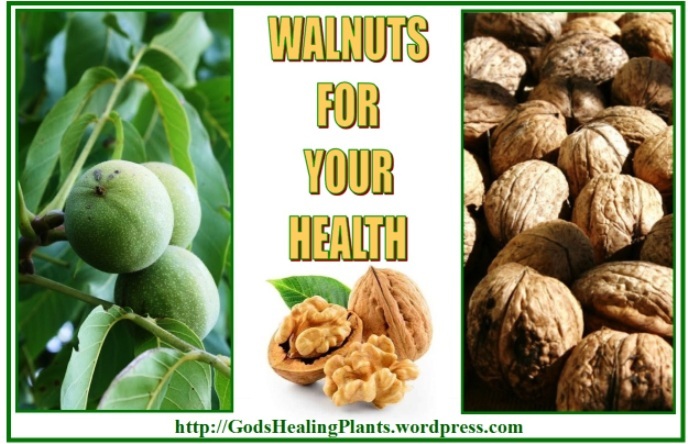 There are three main types of walnuts; the English walnut, also known as the Persian walnut, the Black walnut, and the White or butternut walnut. The most popular type in the US is the English walnut, which has a thinner shell and is the easiest to crack open. The Black walnut has a thicker shell and more pungent flavor. It is mostly cultivated for its strong wood. The white walnut is sweeter and oilier than the other two, but it is not commonly found in stores. Walnuts are a rich source of vitamin C, B vitamins (vitamin B6, thiamin, riboflavin, niacin, pantothenic acid, and folate), vitamin E, as well as minerals such as calcium, iron, magnesium, potassium, sodium, and zinc. Walnuts are 65 percent fat by weight and 15 percent protein. They are richer than most nuts in polyunsaturated fats (often considered the “good” fats) and have a relatively high amount of omega-3 fatty acid called alpha-linolenic acid (ALA). Walnuts are also particularly rich in an omega-6 fatty acid called linoleic acid. Walnuts contain other essential nutrients such as beta-carotene, lutein, and zeaxanthin, as well as phytosterols. 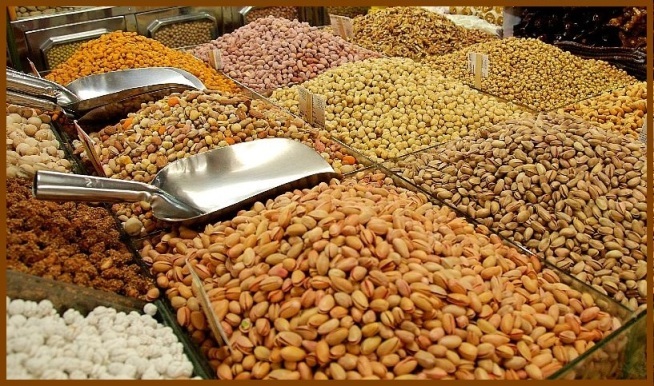 They are a good source of dietary fiber and antioxidants (ellagic acid, catechin, melatonin, and phytic acid). All of these beneficial nutrients contribute to walnuts being thought of by many as ‘power food’. The health benefits of walnuts are many and include reduction of LDL (bad) cholesterol, prevention of inflammation, improvement in metabolism, weight management, and diabetes control. 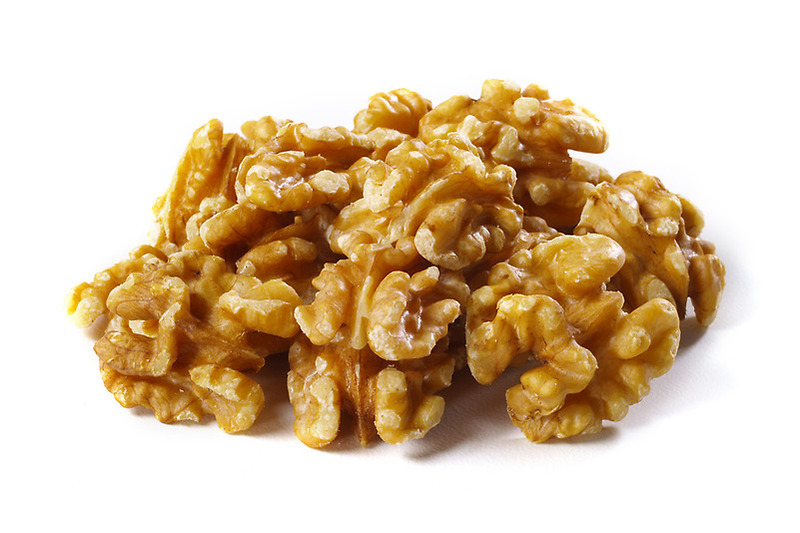 Walnuts can also benefit brain health and act as a mood booster. Here are some additional benefits of consuming walnuts. When purchasing whole walnuts that have not been shelled choose those that feel heavy for their size. Their shells should not be cracked, pierced or stained, as this is oftentimes a sign of mold development on the nutmeat, which renders it unsafe for consumption. Shelled walnuts are generally available in prepackaged containers as well as bulk bins. Just as with any other food that you may purchase in the bulk section, make sure that the bins containing the walnuts are covered and that the store has a good product turnover so as to ensure its maximal freshness. Whether purchasing walnuts in bulk or in a packaged container avoid those that look rubbery or shriveled. If it is possible to smell the walnuts, do so in order to ensure that they are not rancid. Due to their high polyunsaturated fat content, walnuts are extremely perishable and care should be taken in their storage. 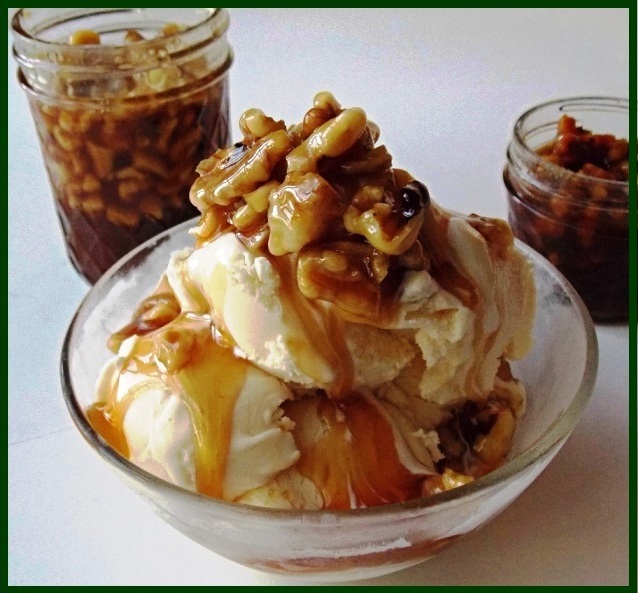 Shelled walnuts should be stored in an airtight container and placed in the refrigerator, where they will keep for six months, or the freezer, where they will last for one year. Un-shelled walnuts should preferably be stored in the refrigerator, although as long as you keep them in a cool, dry, dark place they will stay fresh for up to six months. When walnuts become rancid, they will smell like paint thinner. 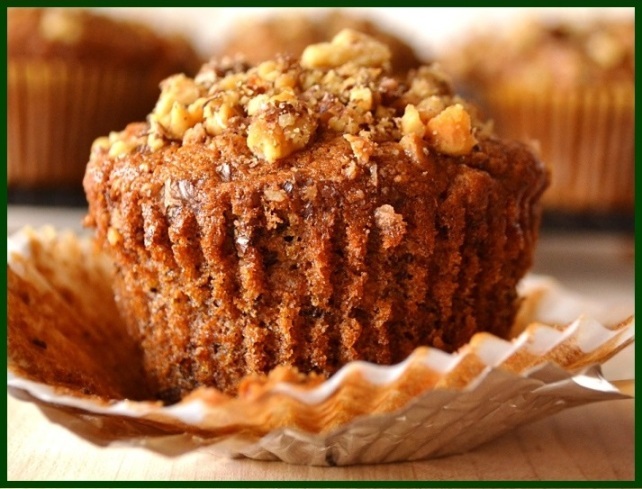 Walnuts have a delicious taste and crunchy texture, which is why they are used in many desserts. Ground walnuts and walnut flour are also used for baking. 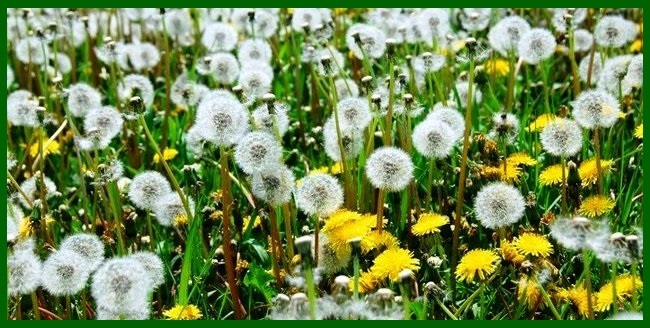 Allergy: Over-consumption may result in a range of allergic reactions from minor to more serious. Digestive issues: Excess intake of walnut may cause nausea, stomach pain, diarrhea, bloating, and more. Pregnancy and lactation: Expecting and nursing women are advised to consume in prescribed amounts only. If you desire to increase its dosage, do consult your doctor. Weight gain: Although it is a source of good fats, too much of a good thing will have adverse results. Remember moderation is the key. Anderson K.J. ; Teuber S.S.; Gobeille A.; Cremin P.; Waterhouse A.L. ; Steinberg F.M. Walnut polyphenolics inhibit in vitro human plasma and LDL oxidation. Journal of Nutrition, Vol. 131, Issue 11: 2837-2842. 2001. Cortes B, Nunez I, Cofan M, Gilabert R, Perez-Heras A, Casals E, Deulofeu R, Ros E. Acute effects of high-fat meals enriched with walnuts or olive oil on postprandial endothelial function. J Am Coll Cardiol. 2006 Oct 17;48(8):1666-71. 2006. PMID:17045905. 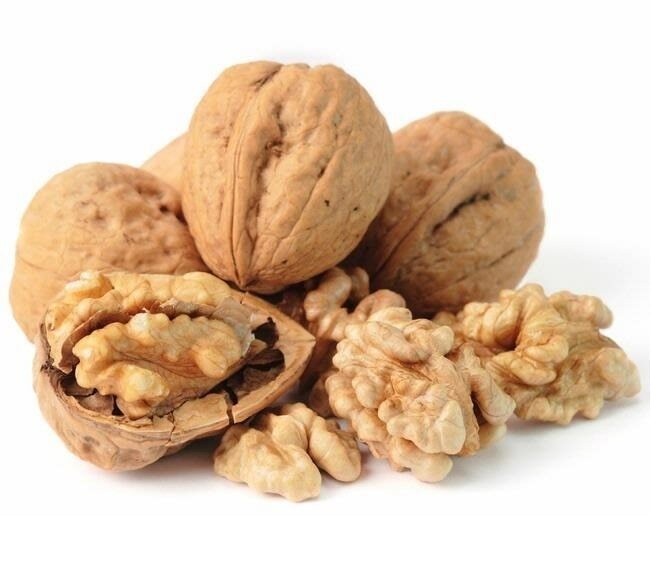 Fukuda T, Ito H, Yoshida T. Antioxidative polyphenols from walnuts (Juglans regia L.). Phytochemistry. Aug;63(7):795-801. 2003. Gillen LJ, Tapsell LC, Patch CS, Owen A, Batterham M. Structured dietary advice incorporating walnuts achieves optimal fat and energy balance in patients with type 2 diabetes mellitus. J Am Diet Assoc. 2005 Jul;105(7):1087-96. 2005. PMID:15983525. 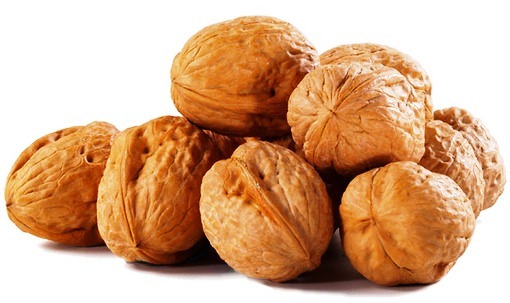 Marangoni F, Colombo C, Martiello A, Poli A, Paoletti R, Galli C. Levels of the n-3 fatty acid eicosapentaenoic acid in addition to those of alpha linolenic acid are significantly raised in blood lipids by the intake of four walnuts a day in humans. Nutr Metab Cardiovasc Dis. 2006 Sep 25; [Epub ahead of print] . 2006. PMID:17008073. Morgan JM, Horton K, Reese D et al. 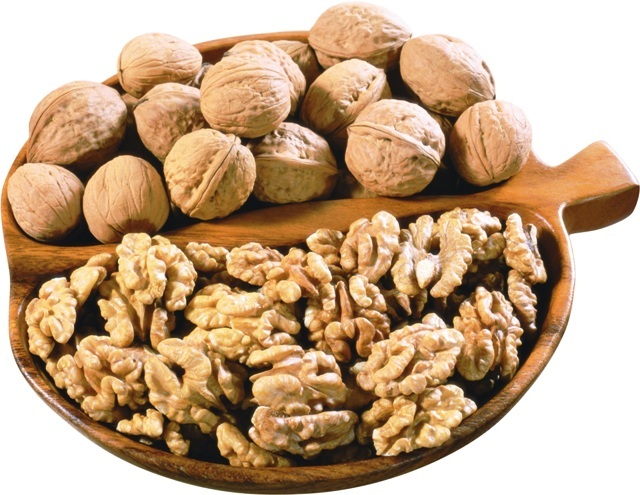 Effects of walnut consumption as part of a low-fat, low-cholesterol diet on serum cardiovascular risk factors. Int J Vitam Nutr Res 2002 Oct; 72(5):341-7. 2002. Patel G. Essential fats in walnuts are good for the heart and diabetes. J Am Diet Assoc. 2005 Jul;105(7):1096-7. 2005. PMID:15983525. Reiter RJ, Manchester LC, Tan DX. Melatonin in walnuts: influence on levels of melatonin and total antioxidant capacity of blood. Nutrition. 2005 Sep;21(9):920-4. 2005. PMID:15979282. Ros E, Nunez I, Perez-Heras A, Serra M, Gilabert R, Casals E, Deulofeu R. A walnut diet improves endothelial function in hypercholesterolemic subjects: a randomized crossover trial. Circulation. 2004 Apr 6;109(13):1609-14. 2004. PMID:15037535. 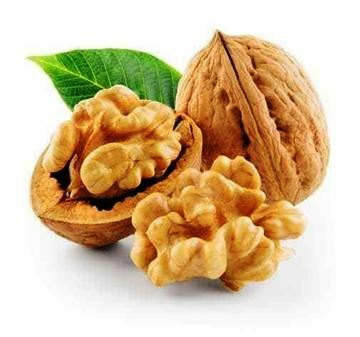 Tapsell LC, Gillen LJ, Patch CS, Batterham M, Owen A, Bare M, Kennedy M. Including Walnuts in a Low-Fat/Modified-Fat Diet Improves HDL Cholesterol-to-Total Cholesterol Ratios in Patients With Type 2 Diabetes. Diabetes Care. 2004 Dec;27(12):2777-83. 2004. PMID:15562184. 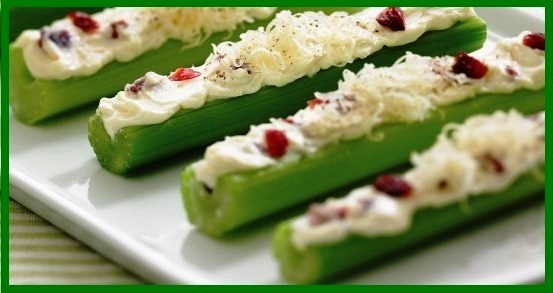 Celery has the scientific name of Apium graveolens, and is a vegetable in the plant family called Apiaceae. It is an extremely old vegetable, with records showing that celery leaves were part of the remains found in the tomb of the pharaoh “King Tutankhamun,” who died in 1323 B.C. Celery is even mentioned in Homer’s “Iliad” and “The Odyssey,” as horses were said to eat wild celery that grew throughout Troy. Celery was probably first used as a food by the French around 1623. For about the next century its use was confined to flavoring because of the strong flavor of early types. By the middle part of the 18th century celery stored in cellars was enjoyed by the more affluent people of northern Europe during the winter. Its use as a food spread rapidly after that time. It most likely was introduced to America by the colonists and by 1806, four cultivated varieties were listed. In the United States today, the variety ‘Pascal’ dominates commercial production. Most people are familiar with the fragrant and flavorful celery, but not everyone knows that its seeds are just as useful and as nutritious as the plant’s stalks. Celery seed has been especially famous in Ayurvedic medicine for thousands of years, where it is used as a diuretic, cold remedy and an anti-inflammatory medicine. But while celery seeds are well-known in Eastern medicine, very few people in Western territories know about the numerous uses of this spice. 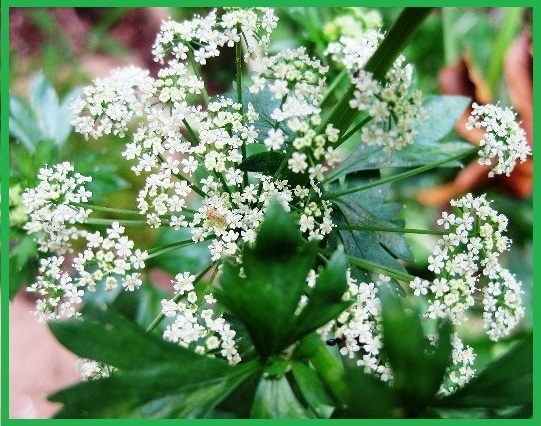 Celery seeds are found in the flowers of the celery plant, which normally develop in the second year after cultivation. The seeds also function as the primary mode of propagation for the celery plant. Celery seeds are usually small and dark brown, and taste and smell like celery stalks. 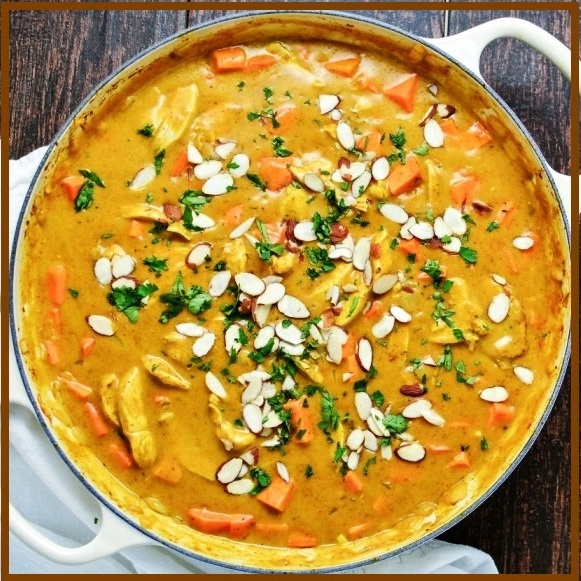 They can boost the flavor of a dish and lend it an aromatic twist. Aside from the culinary use of celery seeds; they can be used to make an extract or oil to deal with different ailments. Celery is a rich source of phenolic phytonutrients that have antioxidant and anti-inflammatory properties. These phytonutrients include: caffeic acid, caffeoylquinic acid, cinnamic acid, coumaric acid, ferulic acid, apigenin, luteolin, quercetin, kaempferol, lunularin, beta-sitosterol and furanocoumarins. Celery is an excellent source of vitamin K and molybdenum. 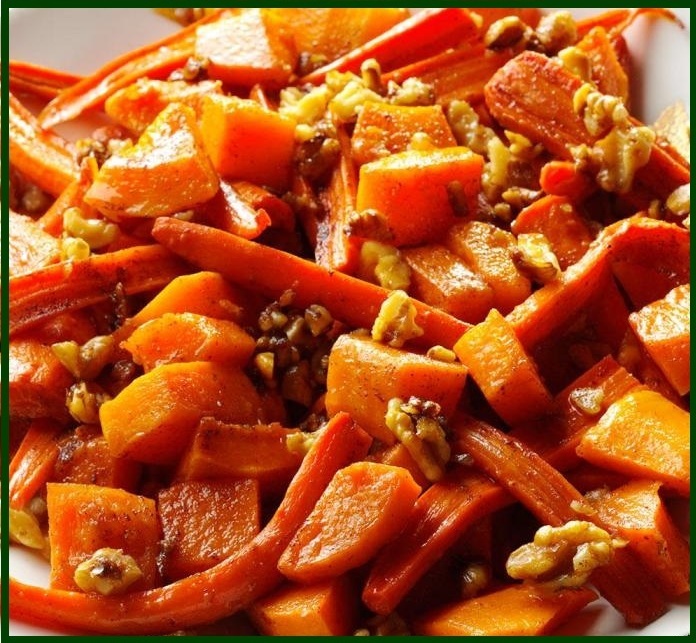 It is a very good source of folate, potassium, dietary fiber, manganese and pantothenic acid. 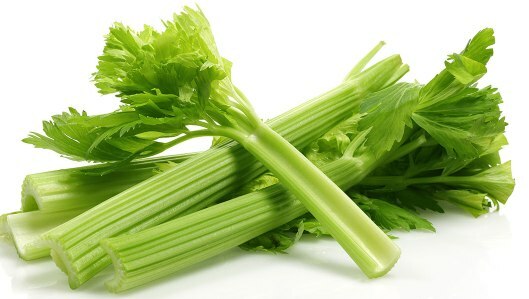 It is also a good source of vitamin B2, copper, vitamin C, vitamin B6, calcium, phosphorus, magnesium and vitamin A.
Celery contains approximately 35 milligrams of sodium per stalk, so salt-sensitive individuals can enjoy celery, but should keep track of this amount when monitoring daily sodium intake. Boosts Immune System – Rich in vitamin C and antioxidants, celery greatly boosts the immune system and makes it more active and efficient. Eating this vitamin C rich vegetable regularly can reduce your risk of catching a common cold, as well as protect you against a variety of other diseases. 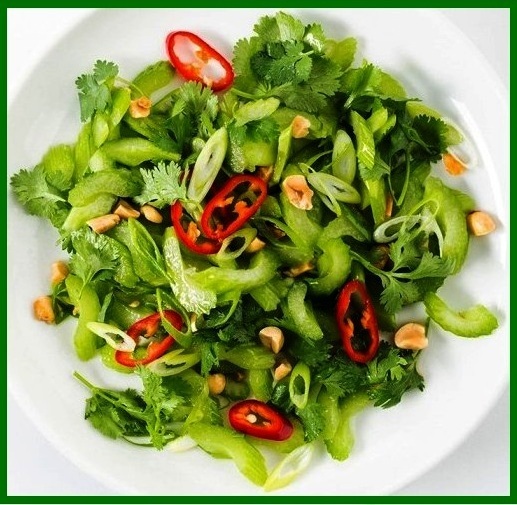 Controls Diabetes – Celery leaves are also eaten for treating various diabetic conditions. This is because of their high fiber content, which has been shown to help manage diabetic symptoms. 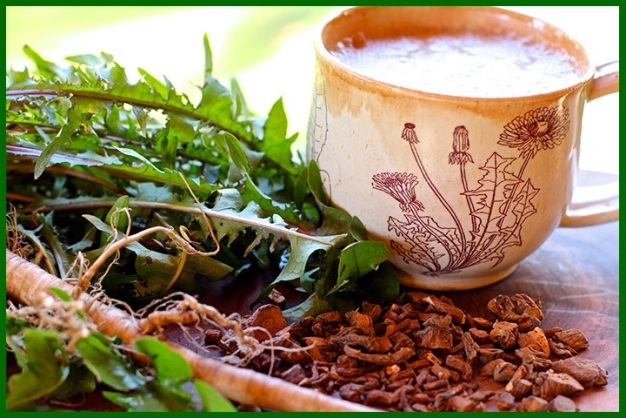 Detoxifies the Body – It acts as an antioxidant, and all parts of celery, including the seeds, roots, and leaves can be used. 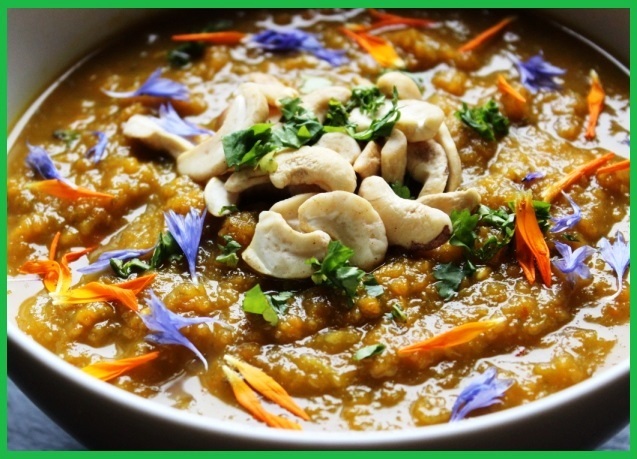 Eating this vegetable regularly helps to avoid diseases of the kidney, pancreas, liver, and gallbladder. Fights Infections – Celery seeds contain antibacterial and antimicrobial properties and has been used to fight infections for centuries. The use of celery extract fights bacterial infections, improves the immune system and inhibits bacterial growth. Helps Prevent Cancer – Celery is one of the cancer-protective vegetables it contains polyacetylenes that are chemoprotective compounds. Polyacetylenes boost the immune system and inhibit the growth of cancer tumor. Moreover, polyacetylenes are well-known for its bioactivities such as antiplatelet-aggregatory, anti-inflammatory, antitumor, antibacterial and cytotoxic properties. 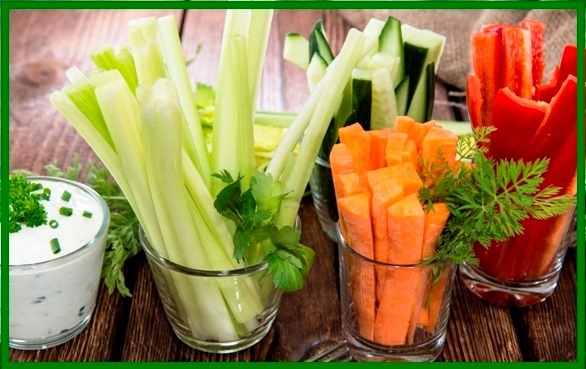 Improves Digestion – The diuretic effect of celery brings a number of digestive benefits. 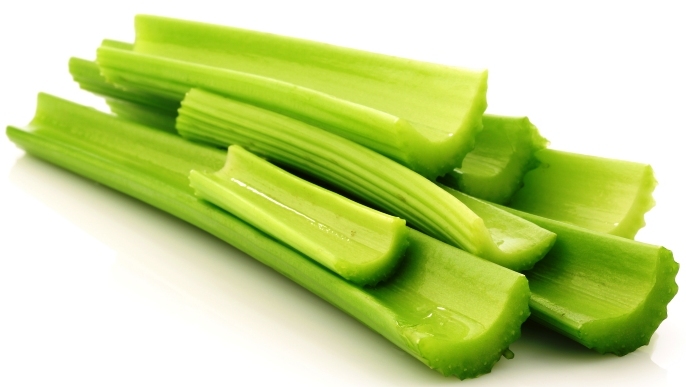 Eating celery can treat water retention, relieve bloating and boost digestion. 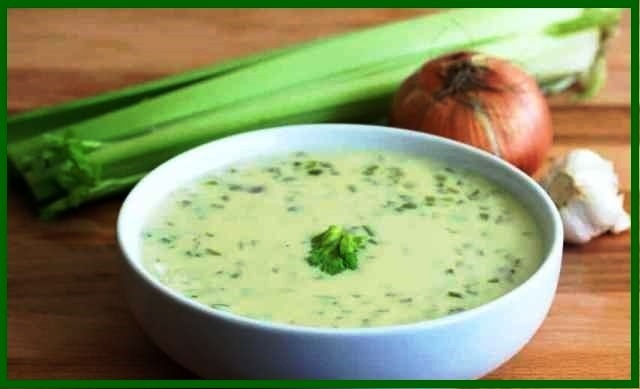 Improves Heart Health – The notable presence of vitamin C, fiber, and other organic chemicals in the roots of celery promotes cardiovascular health. 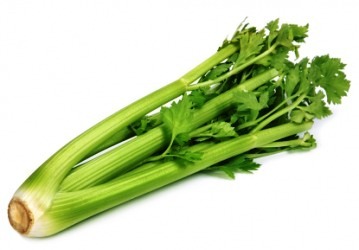 Lowers Arthritis Pain – Celery is great for people suffering from arthritis, rheumatism, and gout. It has anti-inflammatory properties that help reduce swelling and pain around the joints. Celery extracts, which contain 85% 3-n-butylphthalide (3nB), are effective in giving relief from arthritis and muscular pains. It also act as a diuretic, which helps remove uric acid crystals that build up around the body’s joints that can add to the pain and discomfort. Lowers Cholesterol Level – A research study published in the Journal of Agricultural and Food Chemistry suggests that eating celery every day may reduce artery-clogging cholesterol (called LDL or bad cholesterol). 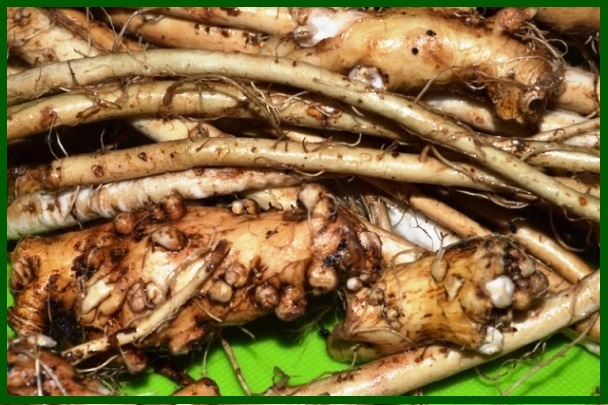 The phthalides in this herb also stimulate the secretion of bile juices, which work to reduce cholesterol levels. Less cholesterol means less plaque on the artery walls and a general improvement in heart health. The fiber that is found in it also works to scrape the cholesterol out of the bloodstream and eliminate it from the body with regular bowel movements, further boosting cardiovascular health. 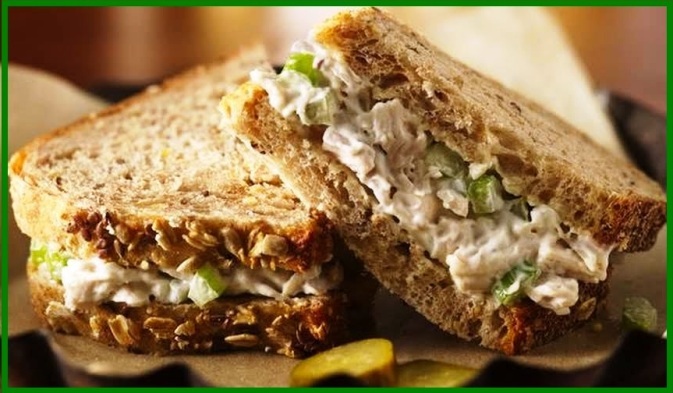 Lowers Inflammation – Celery is loaded with polysaccharides and antioxidants. 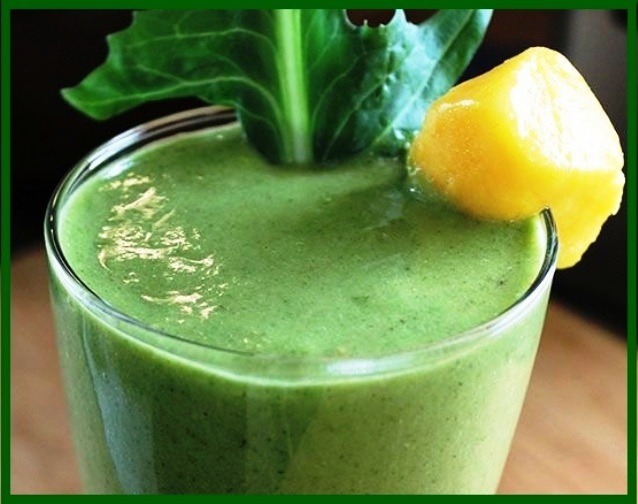 The antioxidants have the ability to cure free-radical damage that contributes to inflammation. Chronic diseases such as heart disease, cancer and arthritis are caused by inflammation. Nerve Tonic – Celery contains high calcium and due to this, it is commonly used to calm the nerves. 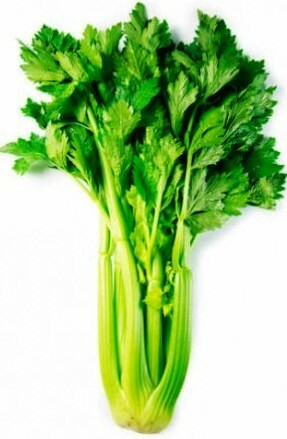 Prevents Liver Diseases – Celery is an ideal liver cleansing food. Regular consumption of celery can help protect kidney health and prevent liver diseases. Celery is high in vitamin C, B, A and iron. 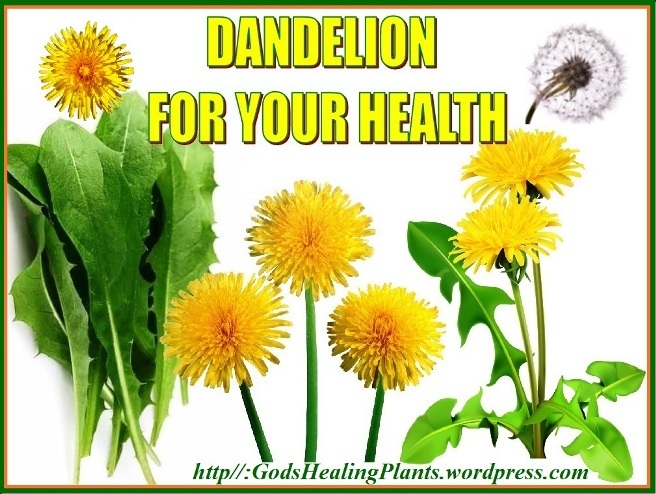 Since it contains diuretic properties, it can remove toxins and contaminants from your body. Prevent Ulcers – Regular consumption of celery can help prevent and treat painful ulcers. 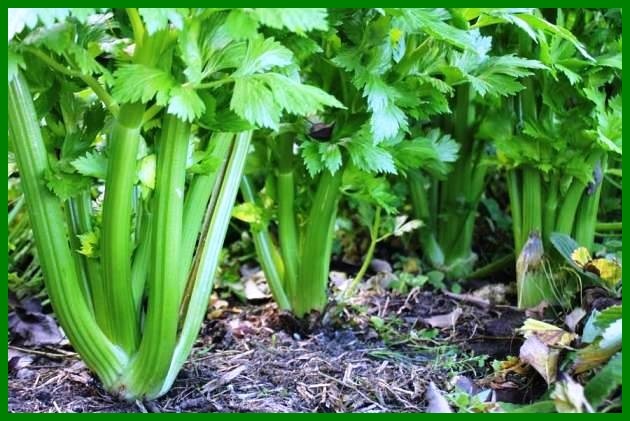 A special type of ethanol extract in celery is effective in preventing the formation of ulcers in the lining of the digestive tract. Reduces Asthma Symptoms – Vitamin C present in celery prevents free radical damage and also has anti-inflammatory properties that lessen the severity of inflammatory conditions like asthma. Reduces Blood Pressure – Celery contains phthalides, which are organic chemical compounds that can lower the level of stress hormones in your blood. Also, a 2009 study revealed that celery has hypolipidemic effects on your body that allow your blood vessels to expand, giving your blood more room to move, thereby reducing pressure. It also contains potassium, which is a vasodilator and helps in reducing blood pressure. When blood pressure is reduced, it puts less stress on the entire cardiovascular system and reduces the chances of developing atherosclerosis or suffering from a heart attack or stroke. Reduces the Risk of Urinary Tract Infections – Celery has the ability to boost urine production and decrease uric acid; therefore, eating celery on a regular basis can help prevent bacterial infections within the digestive tract and reproductive organs. Like cranberries, celery is an effective home remedy for bladder disorders, urinary tract infections, kidney problems and cysts on the reproductive organs. Regulates Fluid Balance – Celery is rich in both sodium and potassium, and both of these minerals help regulate the fluid balance in the body. Salt Alternative – For people who are looking for salt alternatives, ground celery seed spice is a good choice. 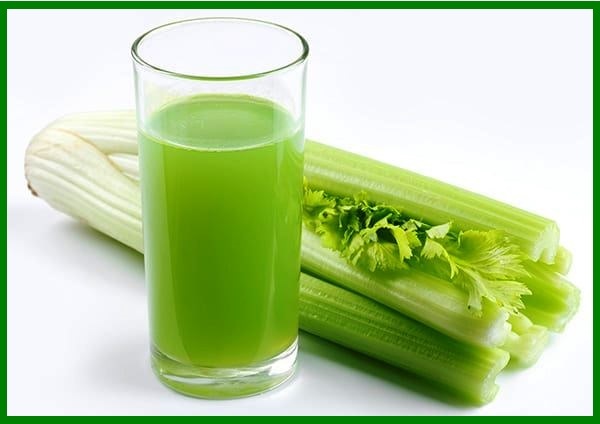 Weight Loss – Regular drinking of celery juice before meals may help reduce your weight. It is very low in calories and it also gives you a feeling of being full; therefore, it can help reduce the tendency to overeat and help you keep the weight down without feeling hungry all the time! 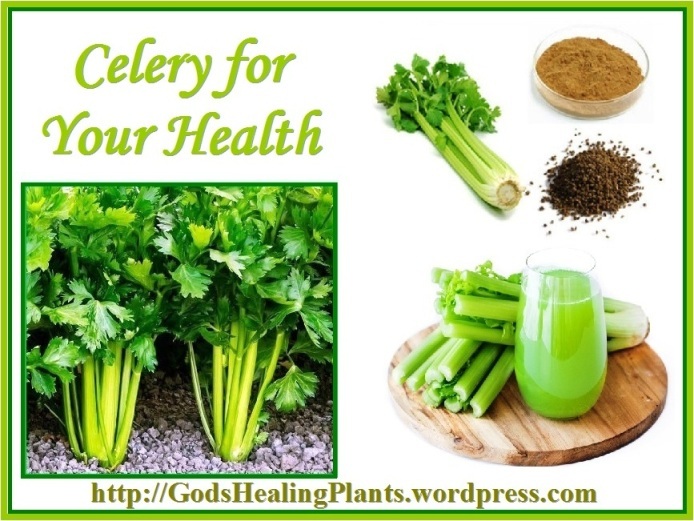 Celery helps prevent many diseases and conditions that include neuritis, constipation, catarrh, pyorrhea and dropsy, mental exhaustion, acidosis, anemia, obesity, joint pain, irritable bowel syndrome, skin disorders migraines and tuberculosis. It also helps in improving overall health and strength of teeth. In North America, the type of celery most grown and eaten is called “pascal celery,” while in Europe “celeriac” celery is more popular. Knowing that celery is one of the most chemical-sprayed vegetables there is, always look for organic celery whenever possible to get the most benefits of celery without consuming toxins and chemicals. The Environmental Working Group’s “Dirty Dozen” shows that celery is usually sprayed with multiple types of pesticides. When picking out celery, make sure the stalks seem firm and aren’t too limber. If the stalks have their leaves attached still, look for brightly colored leaves that are not wilting. Don’t wash celery right away after bringing it home because this can cause it go bad quicker. 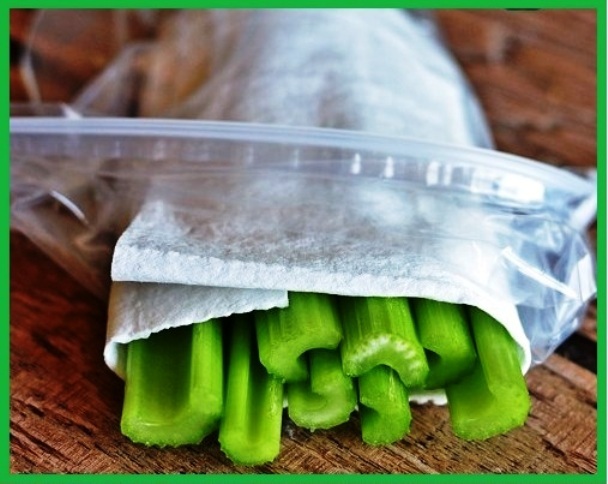 Store celery, wrapped in a moist paper towel in an open plastic bag inside the refrigerator for about five to seven days. It’s not recommended to freeze celery because it becomes mushy once defrosted. To clean and cut celery, discard the base that’s usually firm and white or you can experiment to re-grow it, by putting the cut off base in a container with a small amount of water and watching it grow. 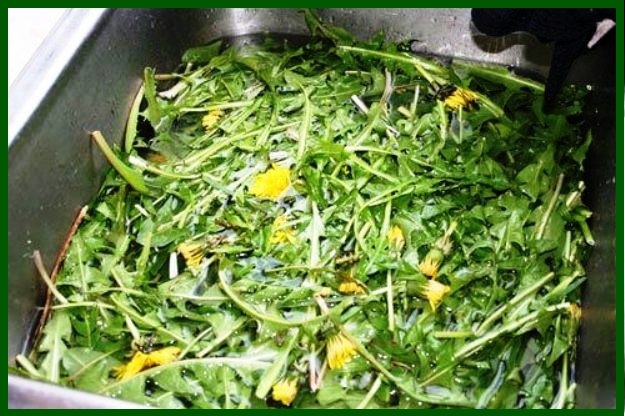 You can save the leaves and use these in recipes, such as salads, soups, stews or a sauté. 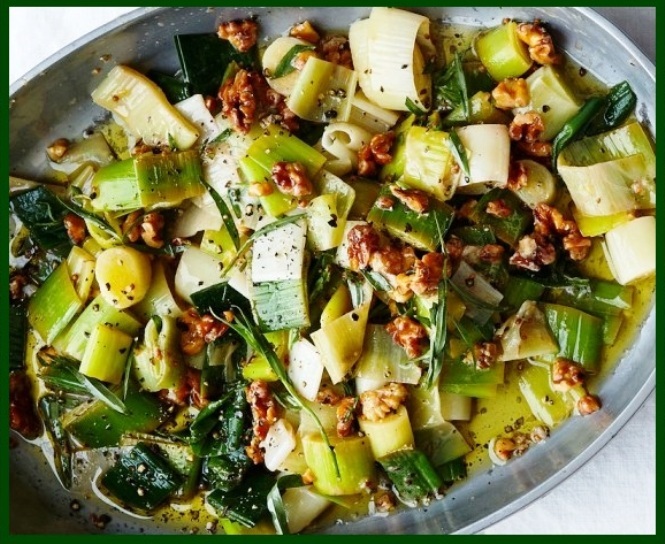 Celery leaves are a good source of vitamins and minerals just like the stalks, so don’t waste them! 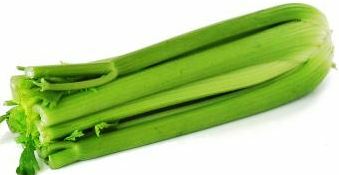 Rinse the celery stalks and leaves well to remove any dirt and then cut the stalks into pieces. 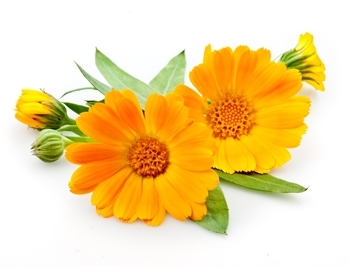 The Calendula flower has been utilized for thousands of years for its impressive health benefits. It is native to Egypt and parts of the Mediterranean but is now grown in every continent, usually blooming during the warmer months of the year (from about May through October in the Northern Hemisphere). 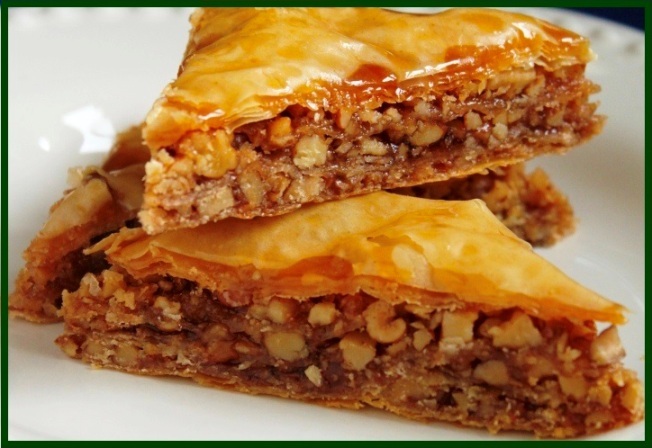 It was an important medicine in Ancient Greece, Rome and Arabia. 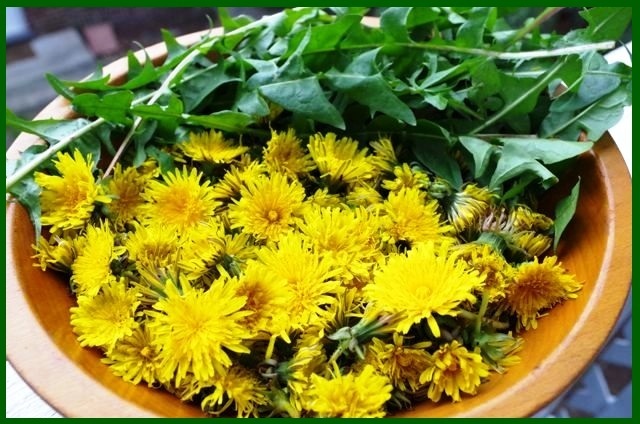 It was most commonly used as a skin treatment, with preparations used for treating minor wounds, calluses, insect bites and stings, eczema, itches, burns and hemorrhoids. Records show that calendula marigold flower petals and florets have been used in folklore medicine since at least around the 11th or 12th century. 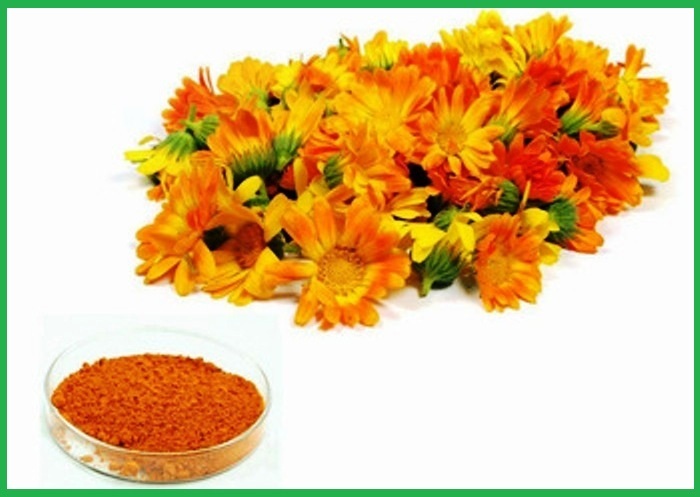 It is a bright orange-colored flower similar to the marigold that actually has many impressive health benefits. 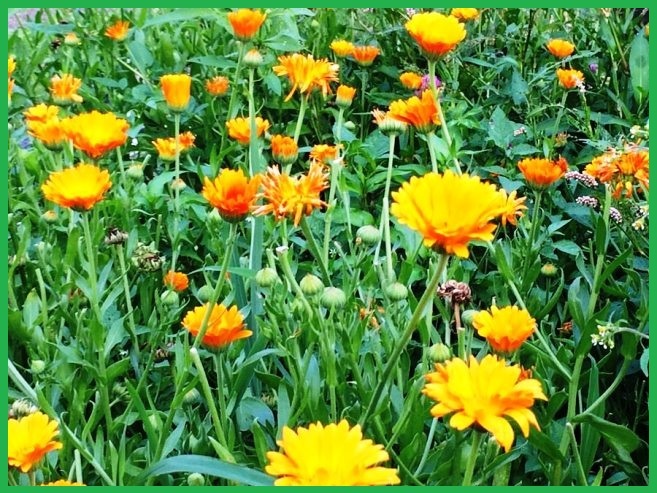 Calendula officinalis is its botanical name and is used to make healing herbal ointments, teas, tinctures and topical treatments that have been in existence for almost 1,000 years. The calendula plant is a short-lived sweet smelling perennial plant that grows up to 80 cm tall. The leaves of calendula are oblong lanceolate are hairy on both sides and are about 5–17 cm long. The flowers are a vibrant golden yellow which is 4–7 cm diameter encircled by two rows of hairy bracts. 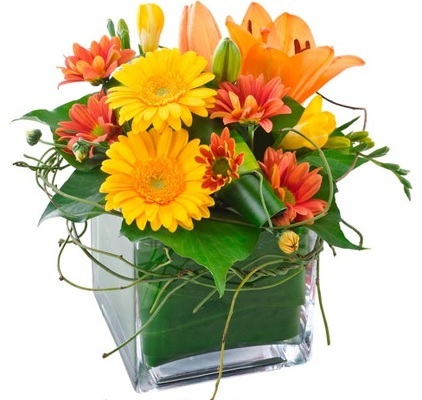 The calendula flowers may grow all year long where environments are suitable. Calendula contains many potent antioxidants and anti-inflammatory compounds that fight infections, decrease swelling, improve blood flow, reduce muscle spasms, slow down effects of free radical damage/aging and more. These include flavonoids, polysaccharides, linoleic acid, acid glycosides, tocopherols, triterpenes saponins and carotenoids. 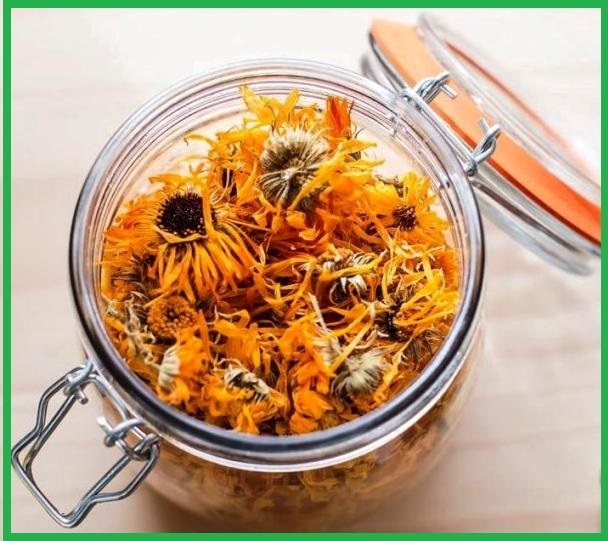 Calendula is a medicinal flower that’s dried and concentrated in order to make ointments, teas and drops that are used both internally and externally. 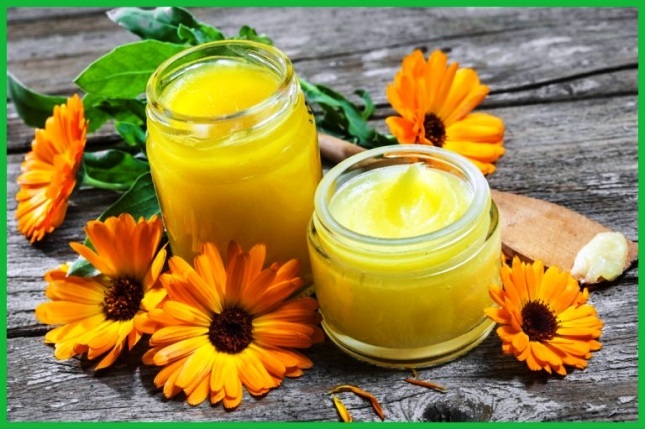 Benefits and uses for Calendula include treating conditions, such as rashes, allergies, eczema and dermatitis; pain, swelling, muscular injuries or sprains; eye inflammation and itchiness caused by conjunctivitis and fungal infections, including athlete’s foot, Candida, ear infections and ringworm. 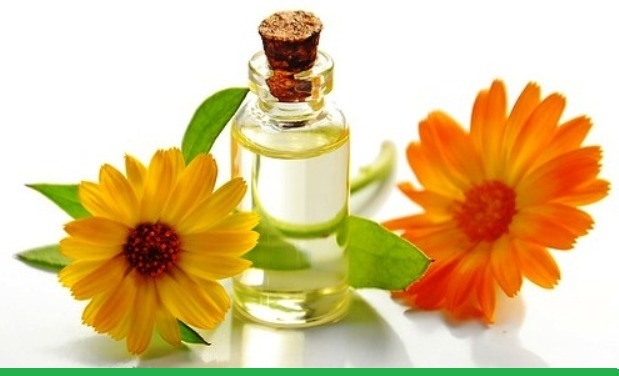 Calendula oil can also be used in body massage. Besides being decorative they are also used in culinary and commercial uses, such as dyeing food products and adding color to salads (since the petals are edible). 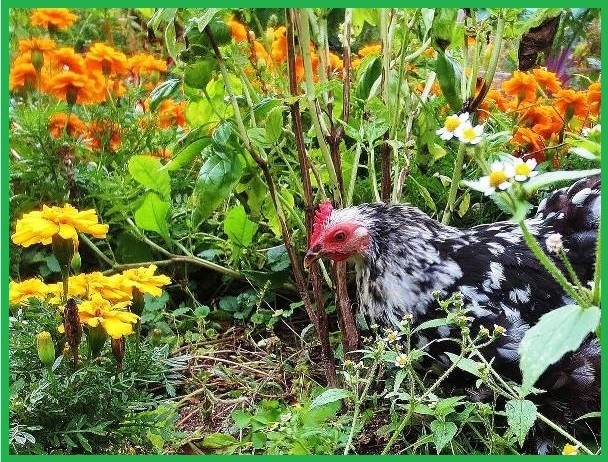 Certain types of calendula marigolds have even been added by farmers to chicken or livestock feed in order to make the chickens’ egg yolks a darker yellow or butter a deeper orange. Look for various calendula products in health food stores and online. Purchasing extracts or drops allows you to add a small amount to skin products you already have as well, such as shampoo or moisturizer. For the best results, keep calendula products away from direct light and moisture, and use the products within one to three years of purchasing in order to prevent spoilage. 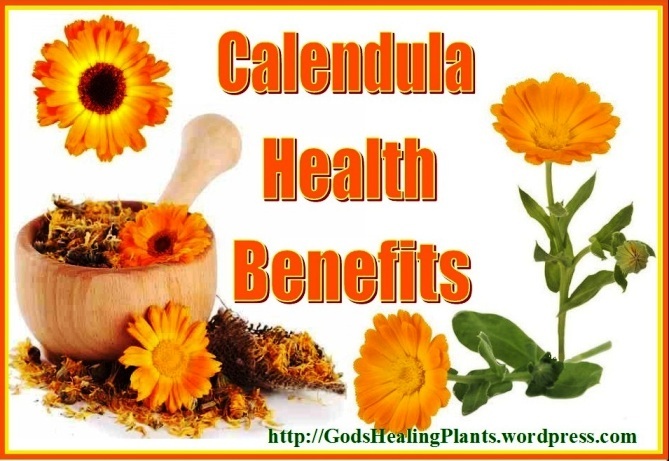 Look for calendula products in homeopathic sections of natural health stores or online. Because the dose depends on the condition you’re treating and concentration of the product, always read dosage recommendations carefully or speak with a homeopathic practitioner for advice. 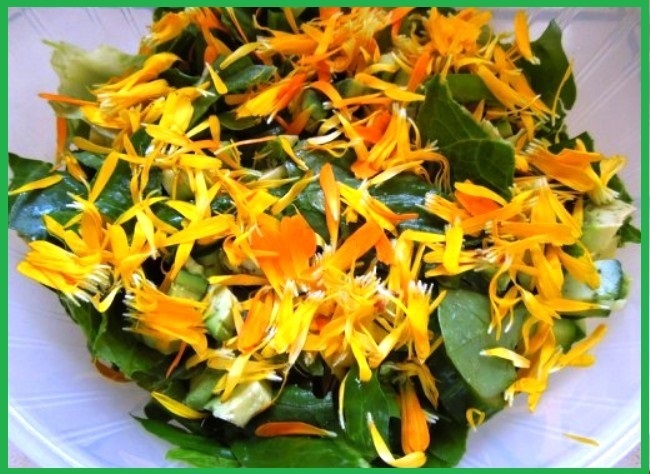 Calendula species have been used in cooking for centuries. The flowers are a common ingredient in German soups and stews, which explains the nickname “pot marigold”. 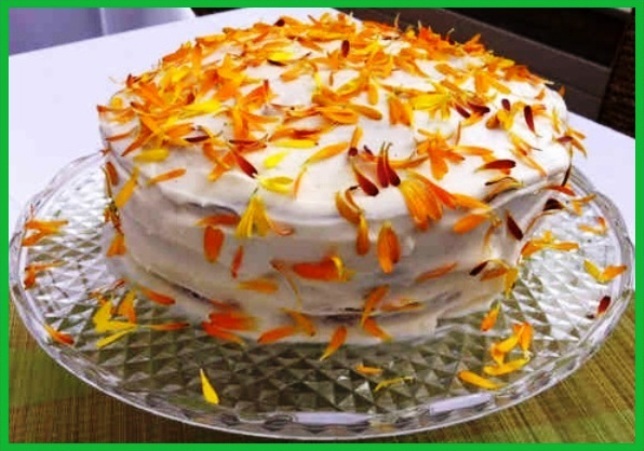 The lovely golden eatable petals can also be used to decorate a cake. The petals can be powdered and used as a coloring and flavoring agent. They are a more affordable alternative to saffron. 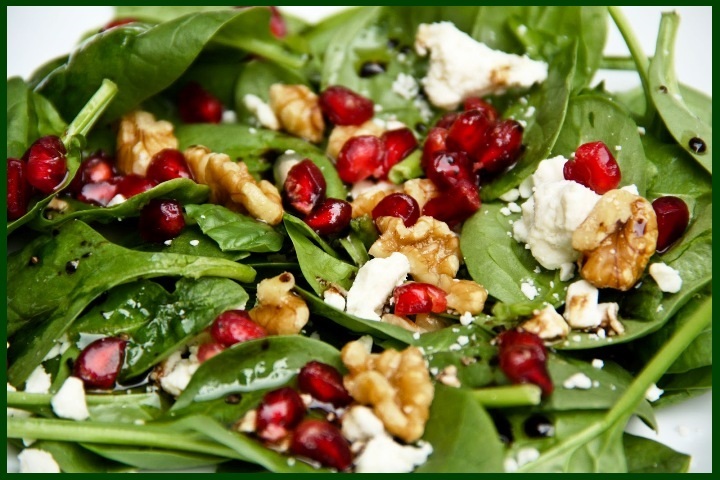 The fresh or dried whole flowers can also be added along with the leaves in salads. 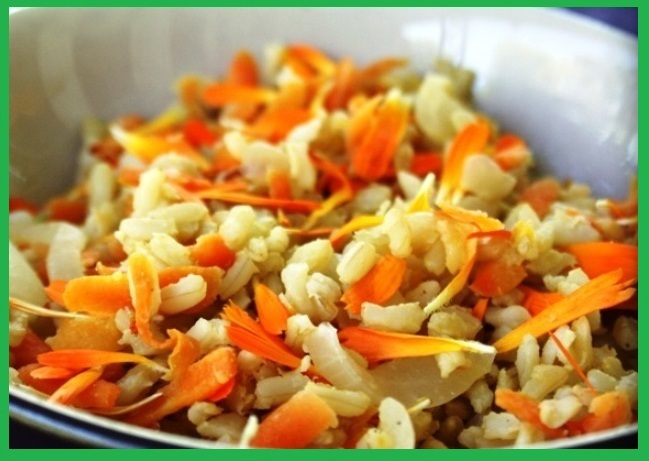 Calendula petals will give a rice dish a lovely color addition. 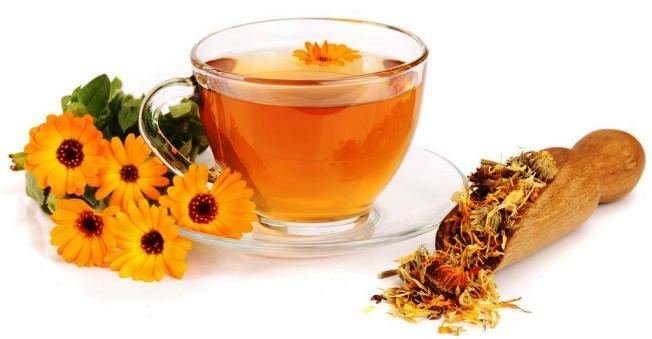 Calendula tea provides health benefits, as well as being delicious. How to make Calendula tea – add a tablespoon of dried flowers to a pot of tea with boiling water, turn the heat off and let it steep for 5 minutes. Marigold tea is also beneficial for treating gastritis, acid ref-lux and ulcers, as well as reducing stomach or menstrual cramps. 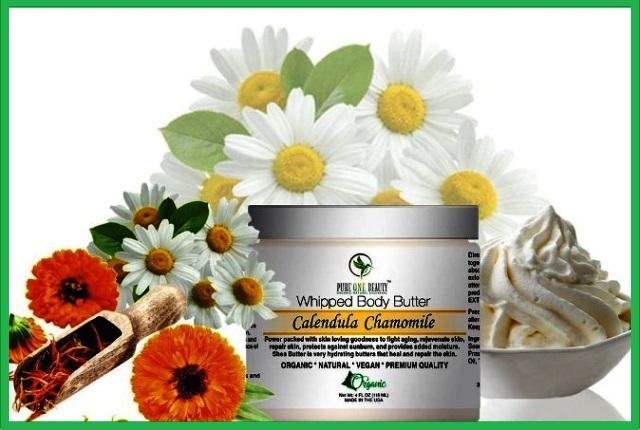 Calendula cream or body butter is known to be well-tolerated, even for people with sensitive skin. 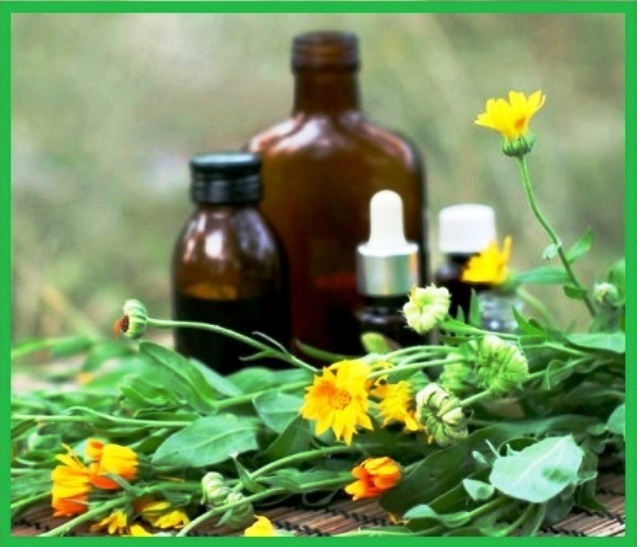 However, you should avoid marigold products if you have a known allergy to ragweed, daisies, chrysanthemums, chamomile, echinacea and other plants in the same family as marigolds. 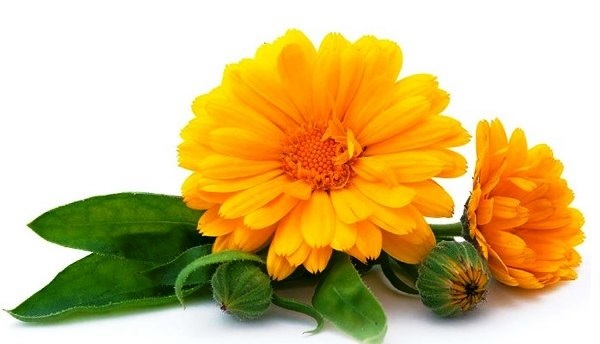 For women who are pregnant or breast-feeding, little is known about the effects of calendula, so it’s best to get your doctor’s advice before taking any internally or using extract on the skin. 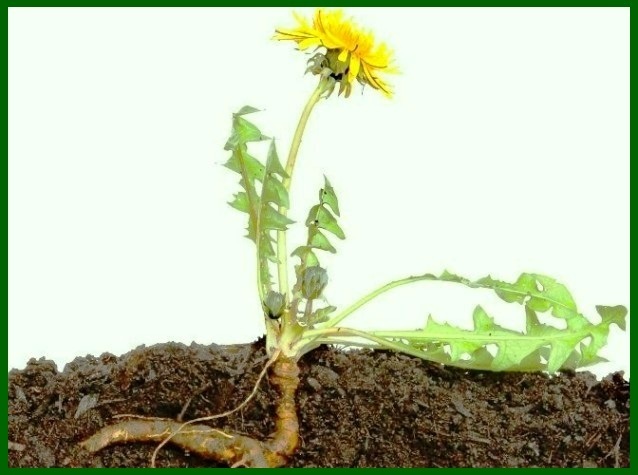 Do not apply calendula directly to open wounds without being directed to do so by your doctor, as this can cause irritation. Start with a very small amount on the skin to test your reaction, and then you can increase your dose slowly. 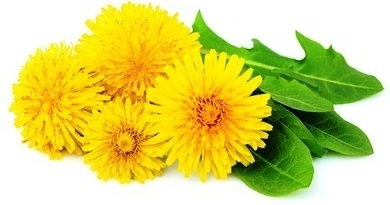 When taking calendula internally by mouth (including drops, liquid extract, tea, etc. ), it’s possible to experience interactions when combined with certain medications. 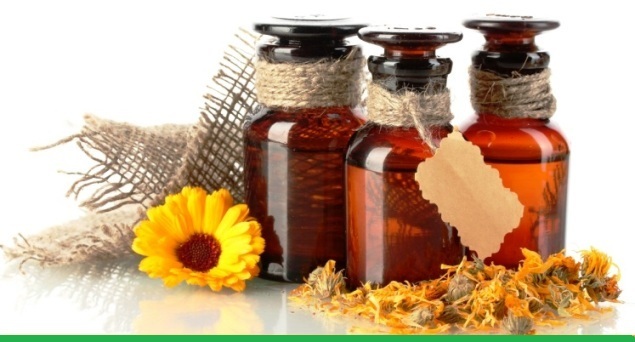 Before using calendula to help ease a health issue, it is best to consult a health practitioner to get the right dosage. Originally from central and southwest Asia, almonds became a staple food that helped sustain the long journeys of nomadic tribes. Wild stands of almond trees grew near trade routes such as the Silk Road that connected central China with the Mediterranean. Easy access allowed for the spread of the wild almond groves because almonds took root in the ground on which they fell. 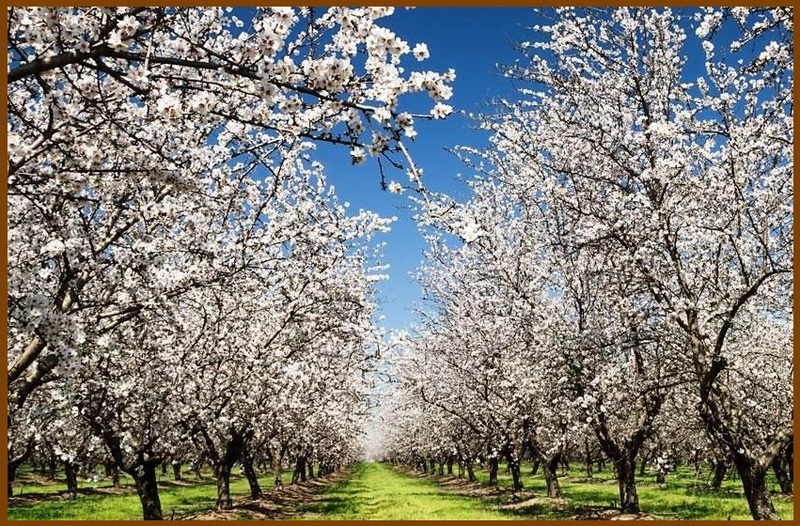 Evidence of this occurs even today in central California, where wild species of almond trees can be seen growing in ditches and roadways. 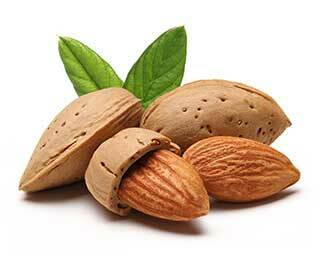 Nearly every ancient civilization used almonds. Hebrew literature from 2,000 B.C. mentions almonds. The Bible makes numerous references to almonds as an object of value and symbol of hope. In Genesis 43:11, for example, a famine in Canaan prompts Jacob to ask his sons to go to Egypt to buy grain. 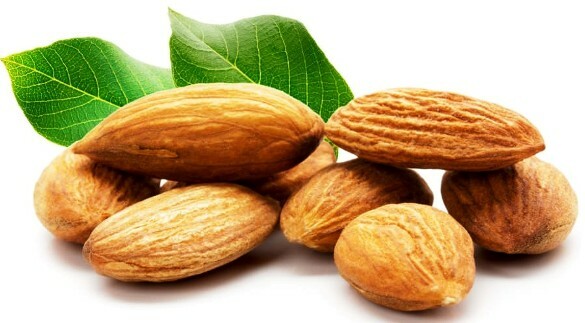 He told them, “Take some of the choice fruits of the land in your bags, and carry down to the man a present, a little balm and a little honey, gum, myrrh, pistachio nuts, and almonds.” And the Bible’s Book of Numbers 17:8 tells of the miracle of Aaron’s rod that blossomed and bore almonds. King Tut took several handfuls of almonds to his grave in 1352 B.C., to nourish him on his journey into the afterlife. 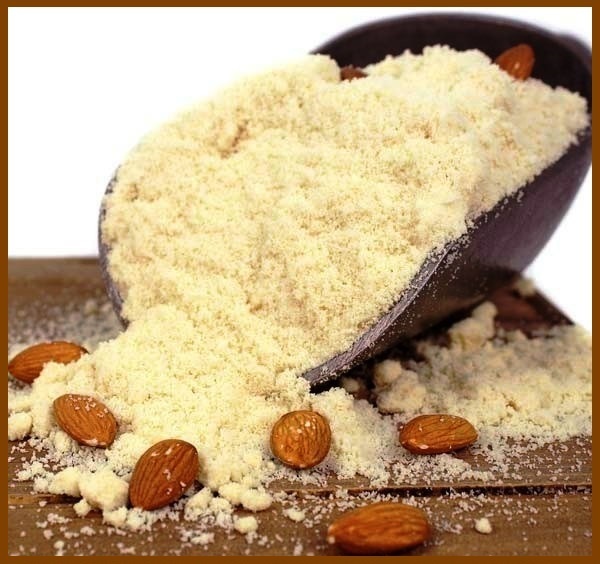 Persians and Arabs made a milk of almond meal and water, which they valued both as a refreshing drink and as an ingredient in other foods. Almonds are now grown in many of the countries that border the Mediterranean Sea including Spain, Italy, Portugal and Morocco. 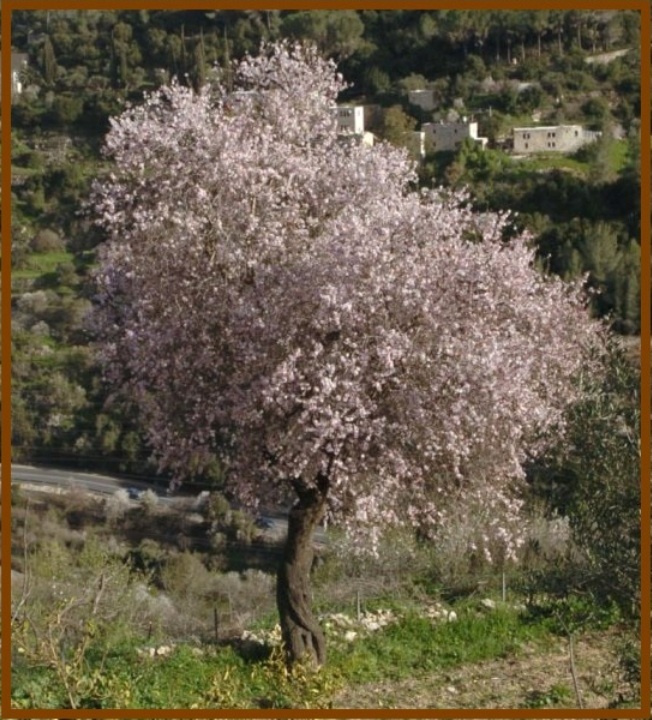 The almond tree is a deciduous tree which can grow as high as 10 meters. The leaves of the almond tree are broad and serrated, and the sprouting flowers seen in early spring are either white or pale pink. 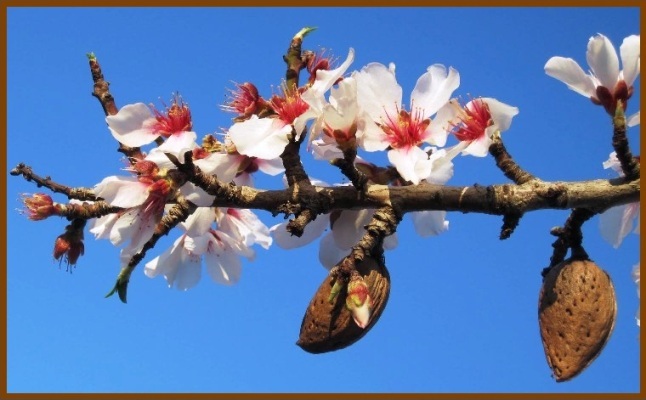 By the time autumn comes (some 7-8 months after flowering), the almond is mature, ripe, and ready to be harvested. Almond trees become productive and begin bearing fruit after five years. The fruit is mature in the autumn, 7–8 months after flowering. 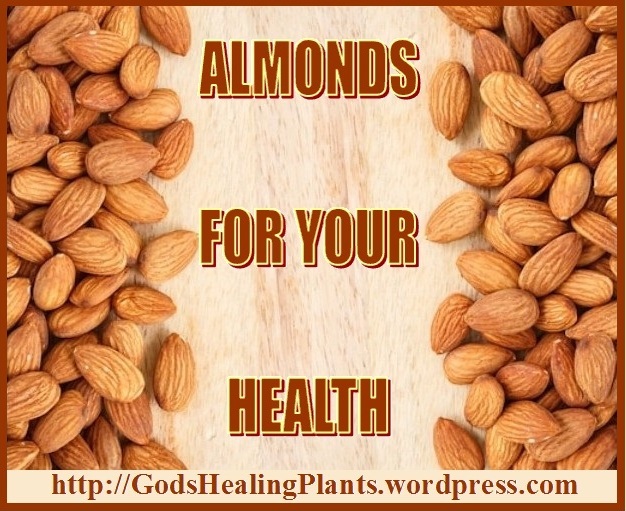 Almond is a highly nutritional nut and is a rich source of fiber, protein, vitamin E, calcium, copper, magnesium, phosphorus, potassium, and iron. It contains zinc, thiamin, and niacin. 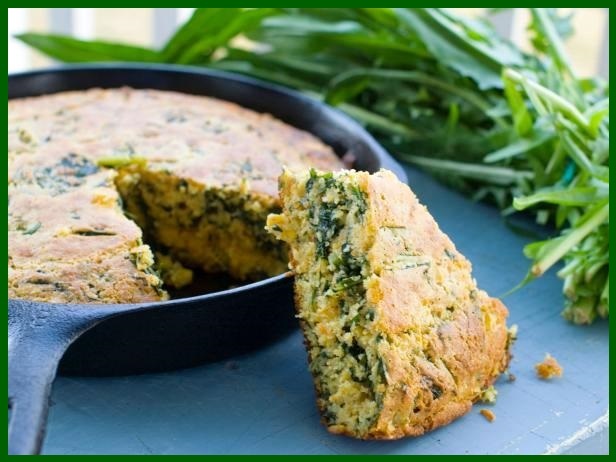 It also provides vitamins such as folate, riboflavin, and vitamin B-6. 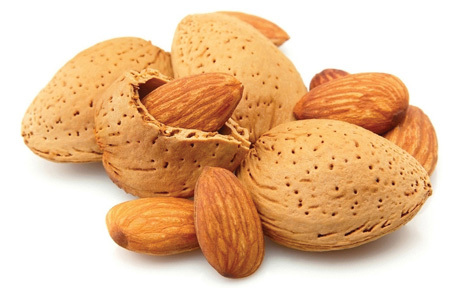 Compared to all other nuts, almonds are richer in nutrients and beneficial components. 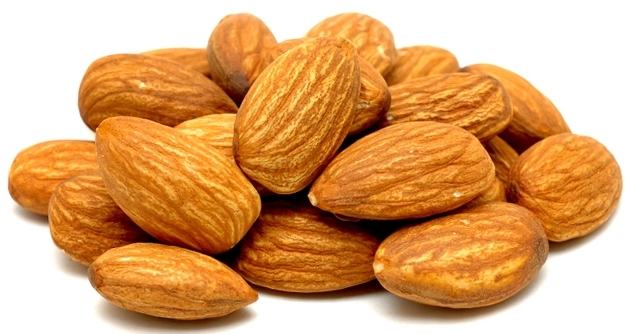 Almonds that are still in their shells have the longest shelf life. If purchasing these, look for shells that are not split, moldy or stained. 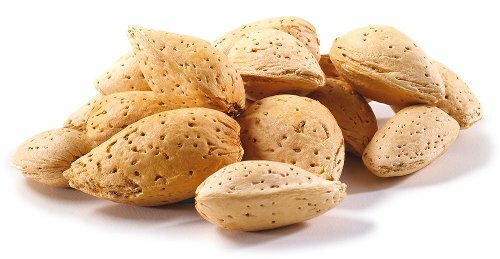 Shelled almonds that are stored in a hermetically sealed container will last longer than those that are sold in bulk bins since they are less exposed to heat, air and humidity. If purchasing almonds in bulk bins make sure that the store has a quick turnover of inventory and that the bulk containers are sealed well in order to ensure maximum freshness. Look for almonds that are uniform in color and not limp or shriveled. In addition, smell the almonds. They should smell sweet and nutty; if their odor is sharp or bitter, they are rancid. Since almonds have a high fat content, it is important to store them properly in order to protect them from becoming rancid. 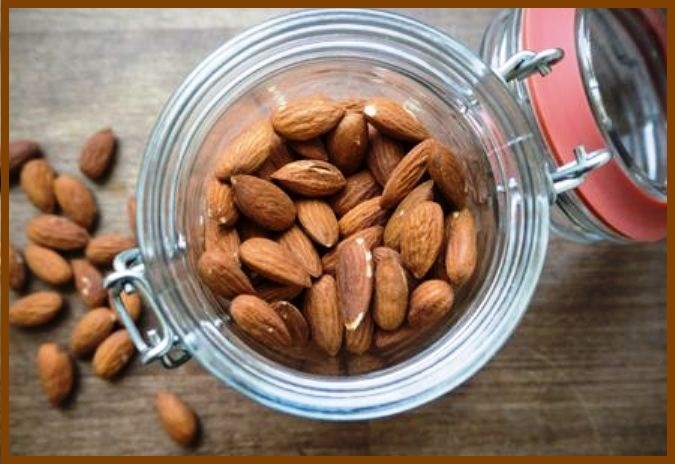 Store shelled almonds in a tightly sealed container, in a cool dry place away from exposure to sunlight. Keeping them cold will further protect them from rancidity and prolong their freshness. 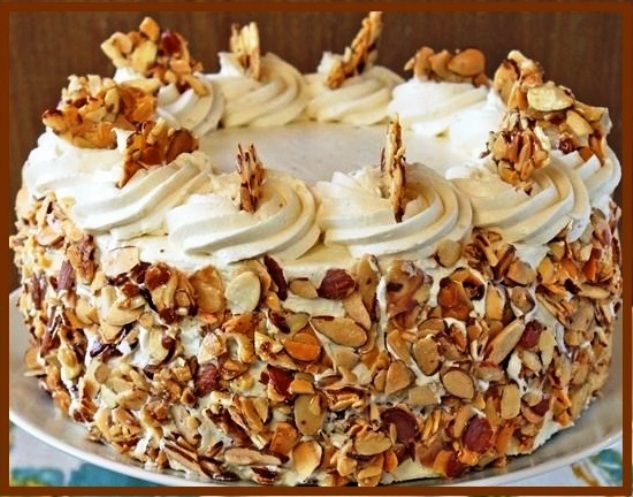 Refrigerated almonds will keep for several months, and if stored in the freezer, in airtight containers, almonds can be kept for up to four year. 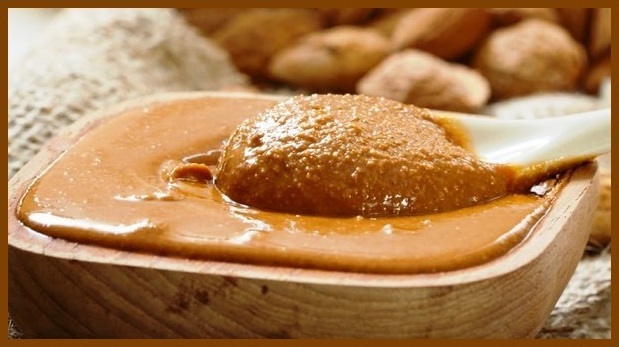 To get maximum nutrition from almonds it is best to soak them before they are eaten, or roast them. Almonds are one of only a few nuts that will actually sprout when soaked. When you soak them it neutralizes the phytate, allowing the nutrients from the nut to be released. 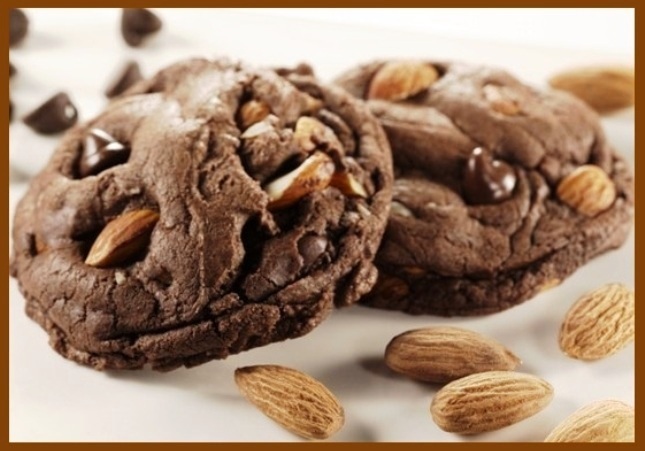 Almond flour is great in gluten-free cooking and baking. 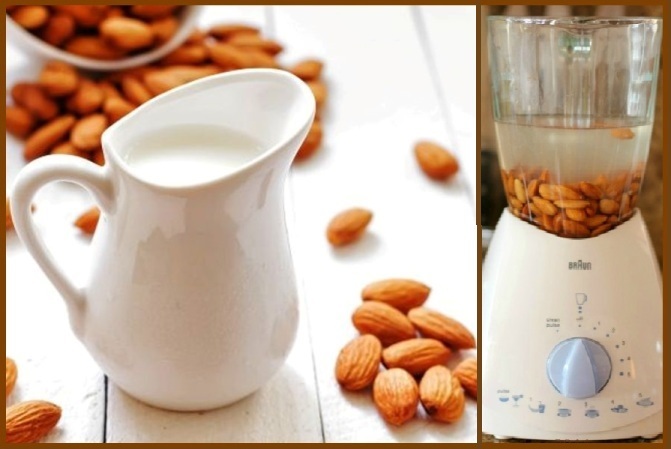 Almond Milk with its mild flavor is a very good alternative for those who need to be dairy free, soy free or are vegan. 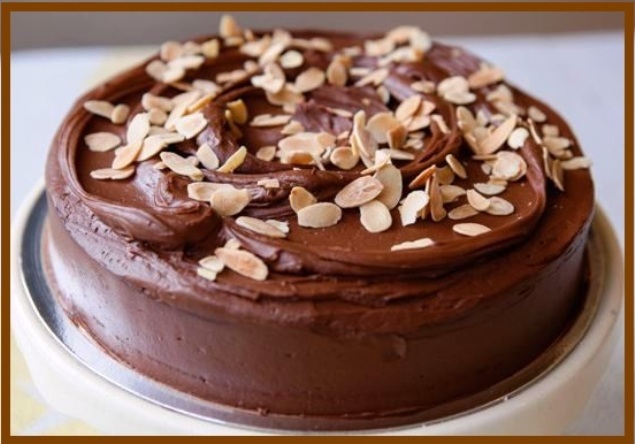 One popular use of almonds in Italy is to crush almonds into marzipan, which is used as a sweet ingredient in baked goods. 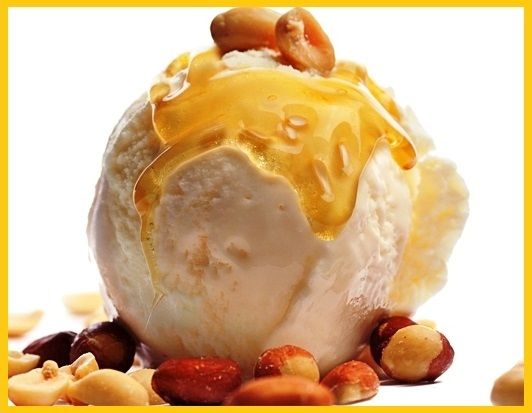 Almonds have consistently been determined to have high oxalate content. Oxalates are naturally occurring organic acids found in a wide variety of foods, and in the case of certain medical conditions, they must be greatly restricted in a meal plan to prevent over-accumulation inside the body. Raw almonds are very good for you, but as with everything else, moderation is the key. The mineral content is impressive and can help you with everything from osteoporosis to cognitive function. 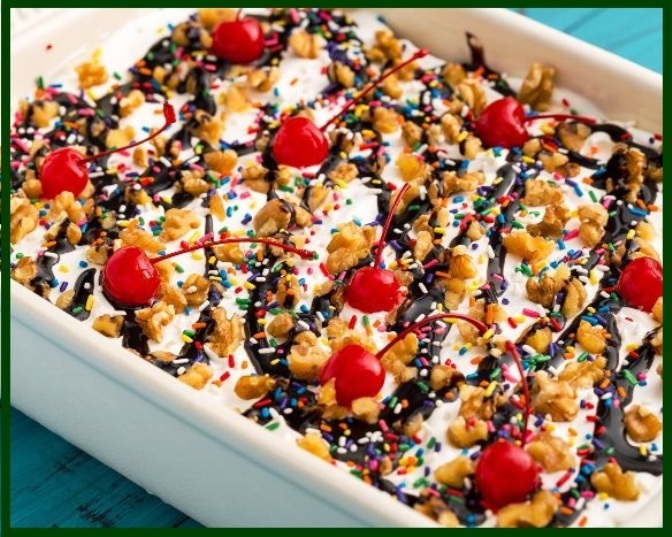 Similarly, the fat content may be high, but much of that is in the form of “good” fats. People having kidney or gallbladder problems should avoid eating almonds; and remember you should always consult your doctor or nutritionist when you have doubts about your body. Olive trees have been cultivated in parts of the Mediterranean, including Crete and Syria, for at least 5,000 years. This ancient tree is also native to parts of Asia and Africa. Olives constitute one of the world’s largest fruit crops, with more than 25 million acres of olive trees planted worldwide. 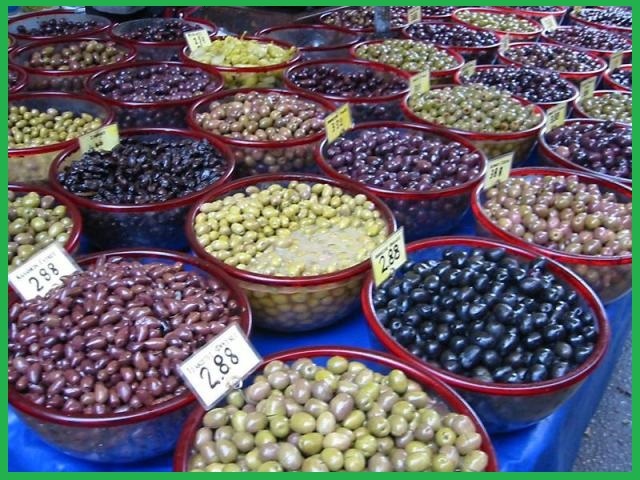 Spain is the largest single producer of olives at approximately 6 million tons per year. Italy is second at approximately 3.5 million tons, followed by Greece at 2.5 million. Turkey and Syria are the next major olive producers. Mediterranean production of olives currently involves approximately 800 million trees. 90% of all Mediterranean olives are crushed for the production of olive oil, with the remaining 10% kept whole for eating. The olive is a fruit, not a vegetable. There are many types and colors; they come in green, purple, dark brown, black, and even pink color. 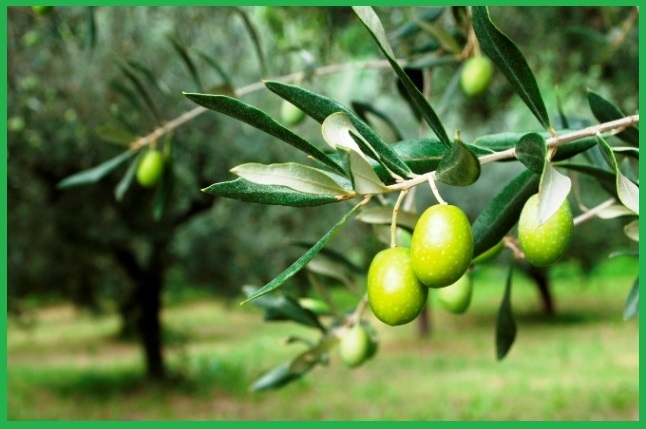 Olive tree can reach 8 – 15 meters (26 – 49 feet) in height, and has oval-shaped, elongated leaves. They are leathery, grayish green on the upper side and whitish on the lower side. The olive flower is white and only flowers after four years. The first harvest can be expected after 15 years. The olive tree is an evergreen and can live up to 2000 years; and the average life of an olive tree is between 300 and 600 years. 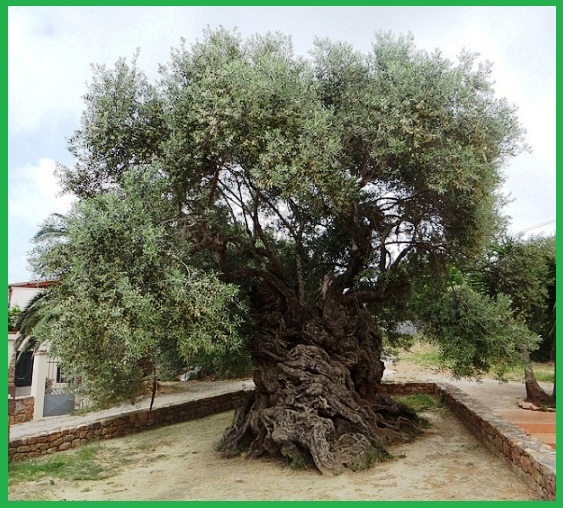 One of oldest olive tree in the world is found on the island of Crete. The tree is about 4,000 years old and is still producing fruit. 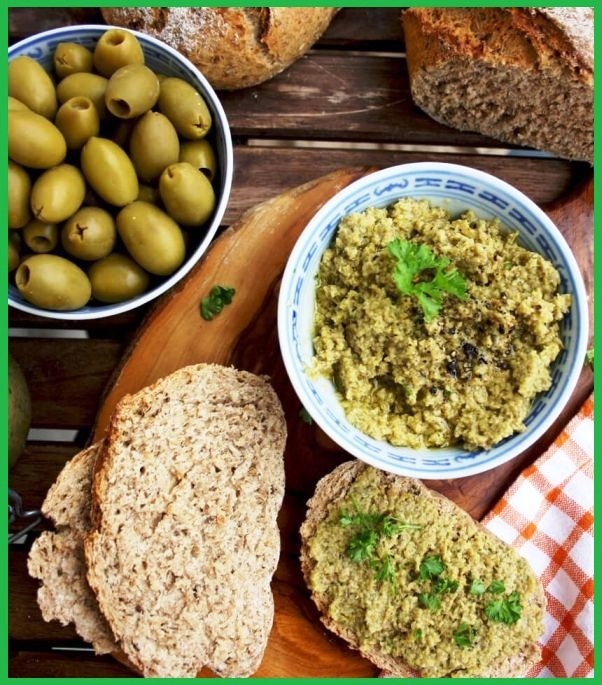 Olives are a remarkable source of antioxidant and anti-inflammatory phytonutrients. Most prominent are two simple phenols, tyrosol and hydroxytyrosol and several terpenes, especially oleuropein, erythrodiol, uvaol, oleanolic acid, elenoic acid and ligstroside. It has flavonoids—including apigenin, luteolin, cyanidins, and peonidins,—are typically provided in valuable amounts by lives, as are hydroxycinnamic acids like caffeic acid, cinnamic acid, ferulic acid and coumaric acid. The phytonutrient content of olives depends upon olive variety, stage of maturation, and the way it is treated after being harvested. 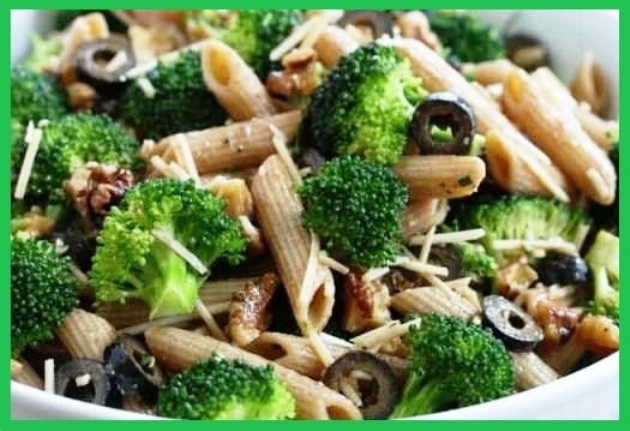 Olives are a very good source of copper and a good source of iron, dietary fiber and vitamin E.
Olives are loaded with antioxidants, which plays out in the prevention of a number of different diseases, including heart disease, stroke, DNA damage, and cancer, specifically breast and stomach cancer. Other benefits relate to the health of the nervous system, respiratory system, immunity, and digestion, to name a few. 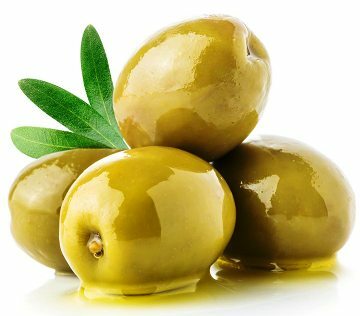 Vitamin E (alpha tocopherol) is another important antioxidant nutrient in olives, along with antioxidant minerals like selenium and zinc. 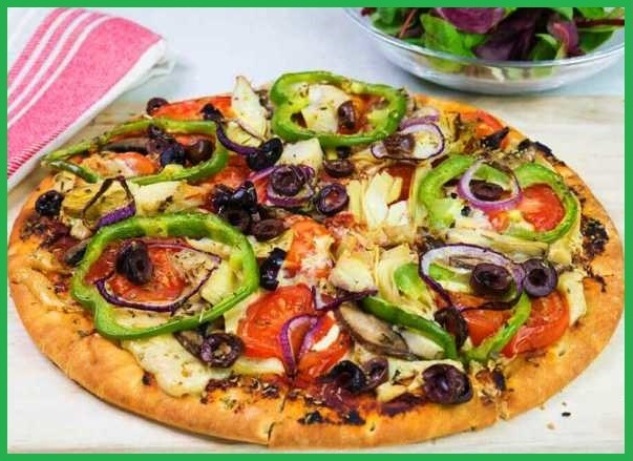 Bone and Connective Tissue – The anti-inflammatory abilities of the monounsaturated fats, vitamin E and polyphenols in black olives may also help dull the asperity of asthma, osteoarthritis, and rheumatoid arthritis. Most of the suffering in having one of these three bone maladies is brought about by high levels of free radicals. 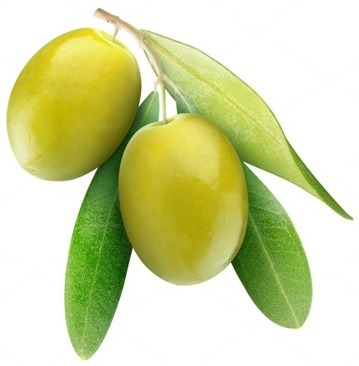 Olive oil also contains a chemical called oleocanthal, which acts as a painkiller. Research has found that oleocanthal inhibits inflammation by the same means that drugs like Ibuprofen do. Cancer Prevention – Black olives are a great source of vitamin E, which has the brilliant ability to neutralize free radicals in body fat. 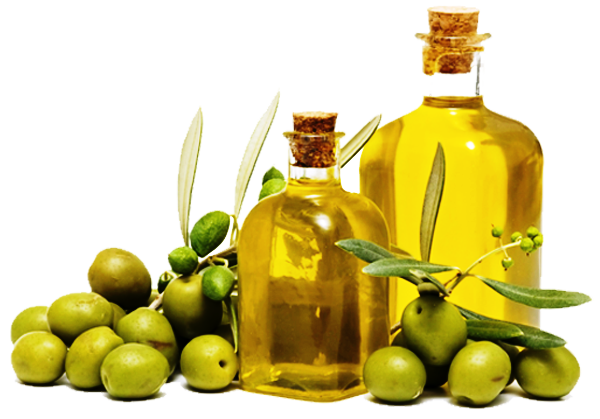 Studies have shown that a diet supplemented with olive oil leads to a lower risk of colon cancer. Cardiovascular Benefits – When free radicals oxidize cholesterol, blood vessels are damaged and fat builds up in arteries, possibly leading to a heart attack. 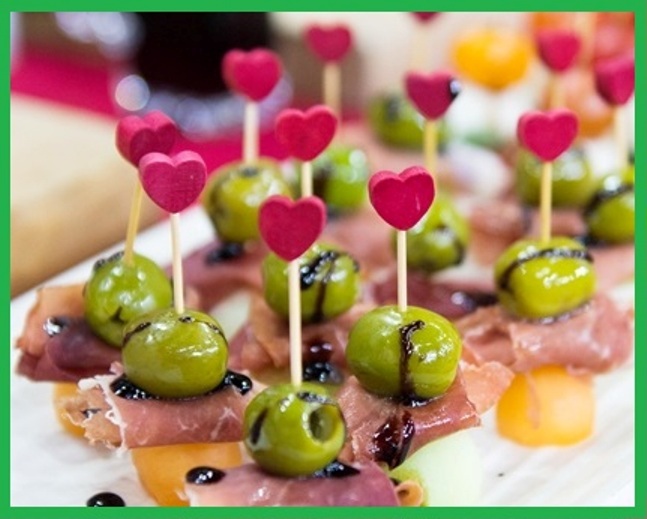 The antioxidant nutrients in black olives impede this oxidation of cholesterol, thereby helping to prevent heart disease. Olives do contain fat, but it’s the healthy monounsaturated kind, which has been found to shrink the risk of atherosclerosis and increase good cholesterol. 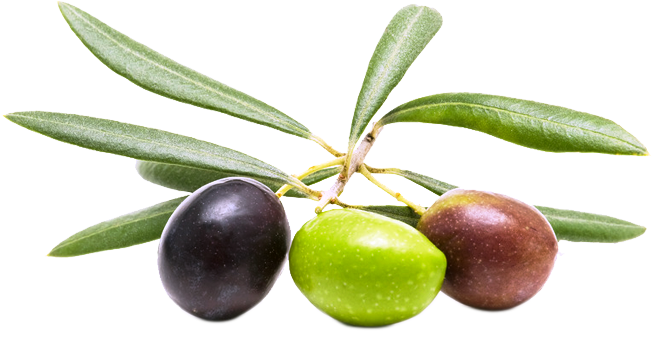 Digestive Tract Health – Frequent consumption of both vitamin E and the monounsaturated fats in black olives is associated with lower rates of colon cancer. 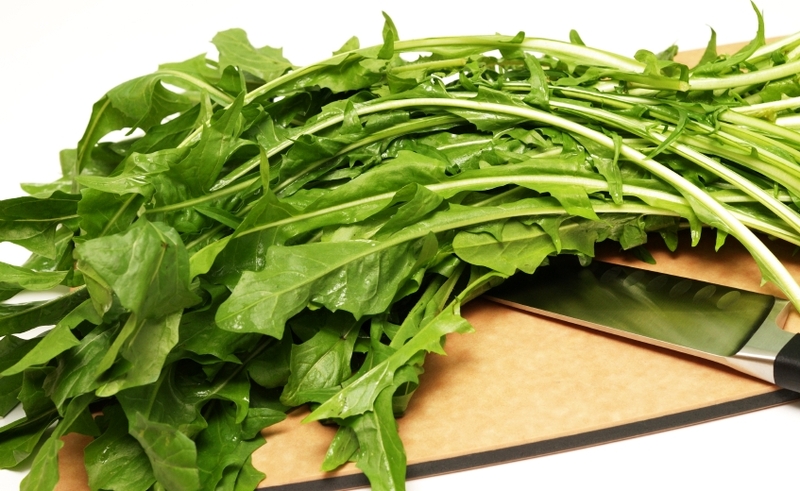 These nutrients help prevent colon cancer by neutralizing free radicals. Olive oil’s protective function also has a beneficial effect on ulcers and gastritis. 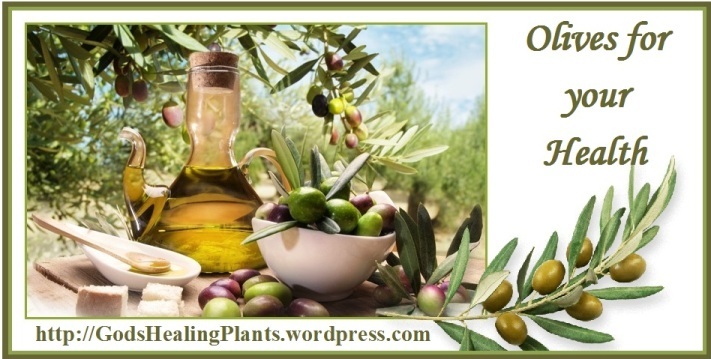 Olive oil activates the secretion of bile and pancreatic hormones much more naturally than prescribed drugs, thereby lowering the incidence of gallstone formation. Eye Health – One cup of black olives contains ten percent of the daily recommended allowance of vitamin A which, when converted into the retinal form, is crucial for healthy eyes. It enables the eye to better distinguish between light and dark, thereby improving night vision. Furthermore, Vitamin A is believed effective against cataracts, macular degeneration, glaucoma and other age-related ocular diseases. Good Source of Iron – Black olives are very high in iron. The ability of red blood cells to carry oxygen throughout the body is due to the presence of iron in the blood. If we suffer from a lack of iron, our tissues don’t get enough oxygen, and we may feel cold or weak. Iron also plays a vital role in the production of energy. 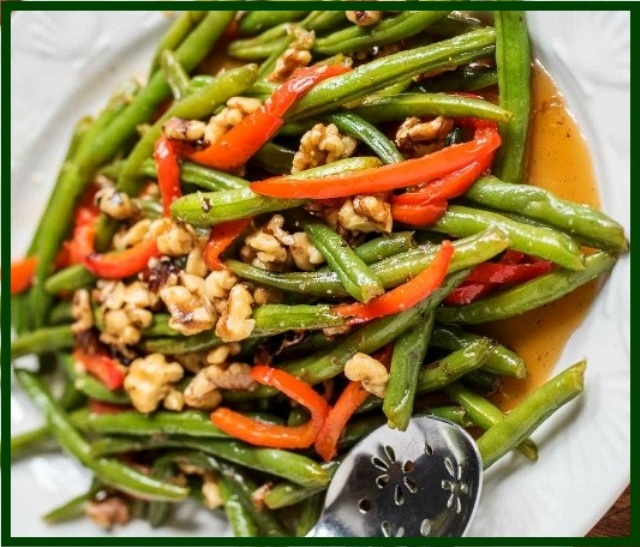 It is a necessary part of a number of enzymes, including iron catalase, iron peroxidase, and the cytochrome enzymes. 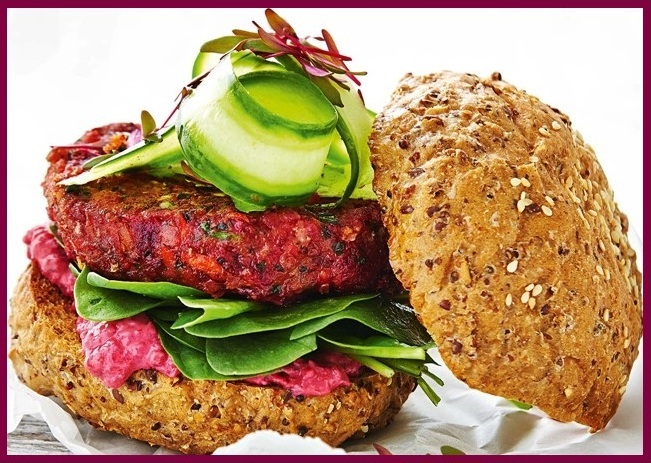 It also helps produce carnitine, a nonessential amino acid important for the utilization of fat. As we see, the proper function of the immune system is dependent on sufficient iron. Skin and Hair Health – Black olives are rich in fatty acids and antioxidants that nourish, hydrate and protect. Chief among those is vitamin E. Whether applied topically or ingested, vitamin E has been shown to protect skin from ultraviolet radiation, thus guarding against skin cancer and premature aging. You can gain a healthy, glowing complexion by washing your face in warm water, applying a few drops of olive oil to vulnerable spots, and letting it work its magic for 15 minutes before rinsing it off. In fact, you can moisturize with olive oil before any bath, and even condition your hair with it by mixing it with an egg yolk and leaving it before rinsing and washing. Olives are traditionally sold in glass jars and cans; however, many stores are now offering them in bulk in large barrels or bins. 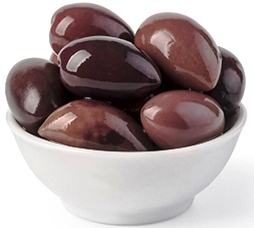 While whole olives are very common, you may also find ones that have been pitted, as well as olives that have been stuffed with peppers, garlic or almonds. If you purchase olives in bulk, make sure that the store has a good turnover and keeps their olives immersed in brine for freshness. 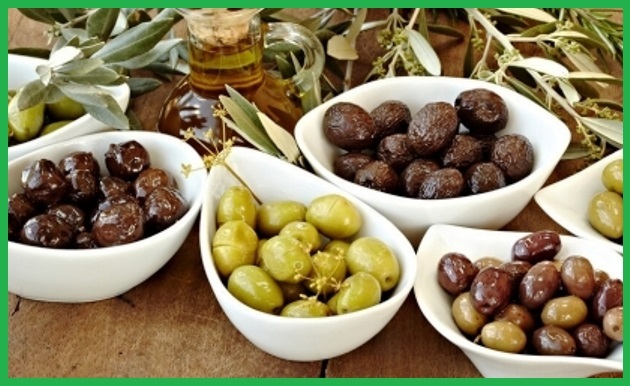 When selecting olives from an olive bar, it’s not uncommon to find several different size ranging from fairly small to fairly large or jumbo and come in many different colors. Each of these options among olive varieties can provide you with valuable health benefits. In general, regardless of the variety you choose, select olives that display a reasonable about of firmness and are not too soft or mushy. Another thing to consider is to buy olives that still have pits. Removing the pit during processing bruises the olive and makes it easier for molds to take over. 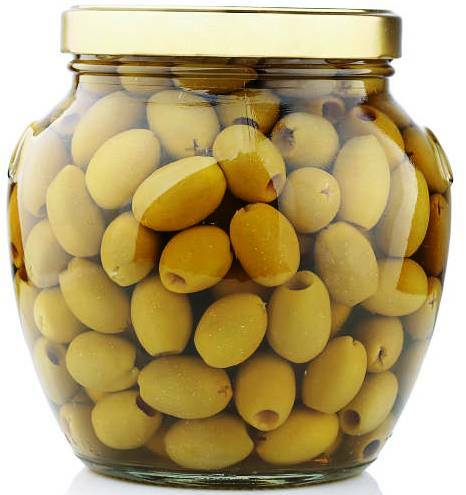 It is better to choose olives packed in glass over those that come in cans because the cans are lined with bisphenol-A (BPA), a hormone-disrupting petrochemical derivative. If olives in cans are the only option, you should avoid buying them from large-scale producers, which are more likely to be sprayed with pesticides during the growing process and then treated with harsh chemicals—namely lye, to speed curing—during processing. 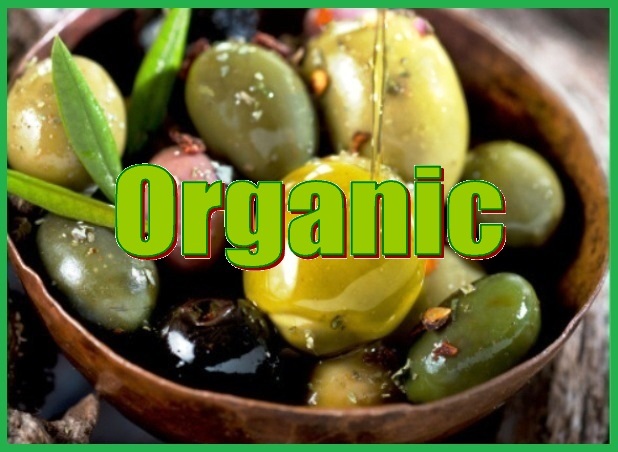 Preferably you should opt for organic olives that are traditionally cured, in order to avoid the ones that have been cured with lye. Olives in glass jars once opened can be stored in the refrigerator for up to one month. Canned olives once opened should be used within a week. 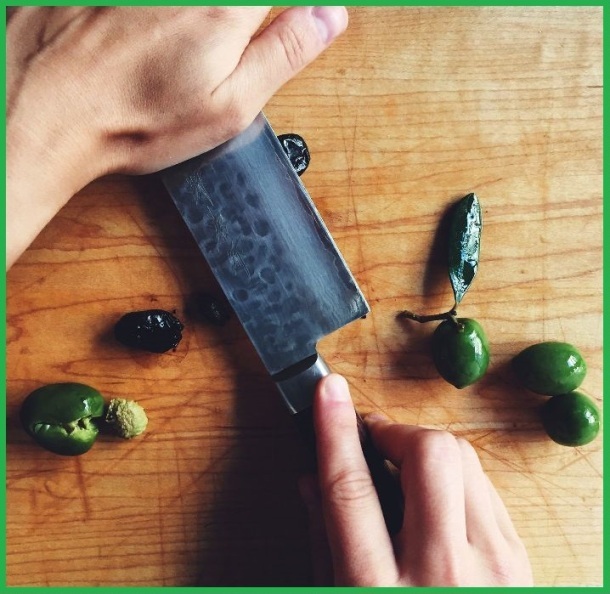 To pit olives, press them with the flat side of a broad knife. This will help break the flesh so that you can easily remove the pit with your fingers or with a knife. 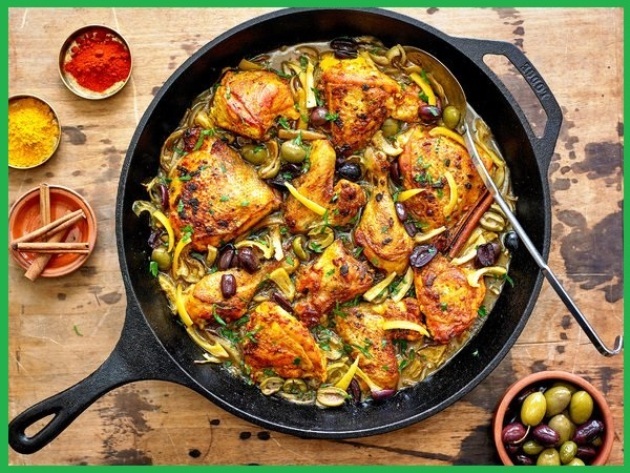 Pan fried chicken with vegetables, spices and olives. 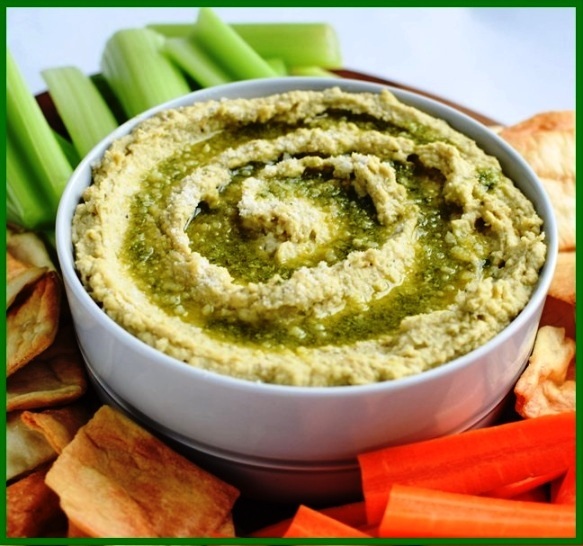 Olive tapenade is a delicious and easy-to-make spread that you can use as a dip, sandwich spread, or topping for any dish. 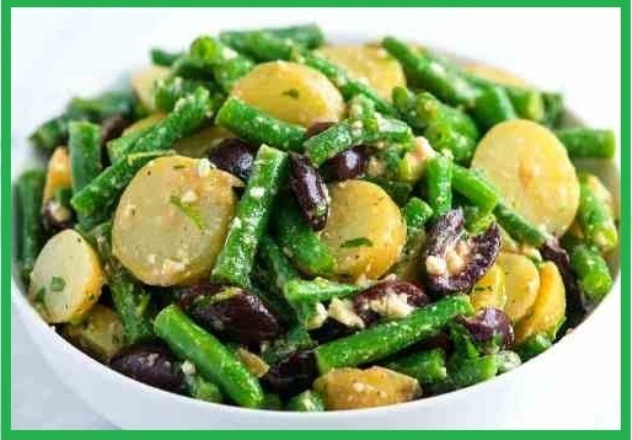 To make it, put pitted olives in a food processor with olive oil, garlic, and your favorite seasonings. 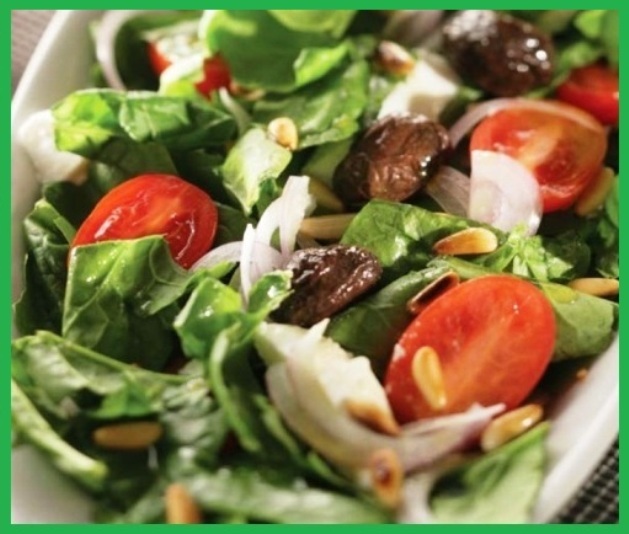 Add chopped olives to your favorite salad recipe. 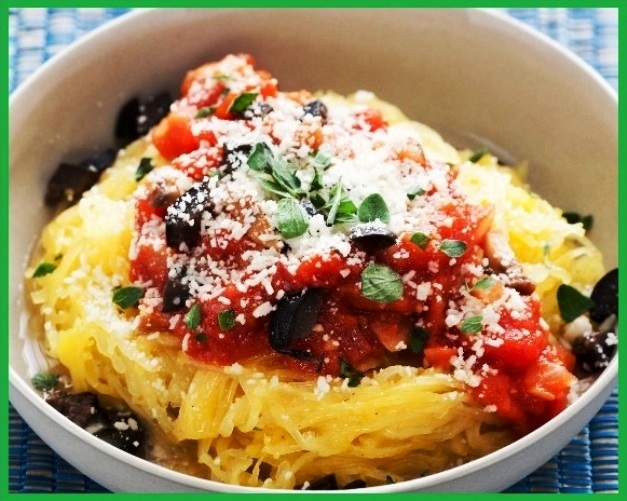 Spaghetti squash with chopped olives, tomatoes, garlic, olive oil and fresh herbs of your choice. Lopez-Lopez A, Rodriguez-Gomez F, Cortes-Delgado A et al. Effect of the Previous Storage of Ripe Olives on the Oil Composition of Fruits. JAOCS, Journal of the American Oil Chemists’ Society. Champaign: Jun 2010. Vol. 87, Iss. 6; p. 705-714. 2010. Malheiro R, Sousa A, Casal S et al. Cultivar effect on the phenolic composition and antioxidant potential of stoned table olives. Food Chem Toxicol. 2011 Feb;49(2):450-7. Epub 2010 Nov 23. 2011. 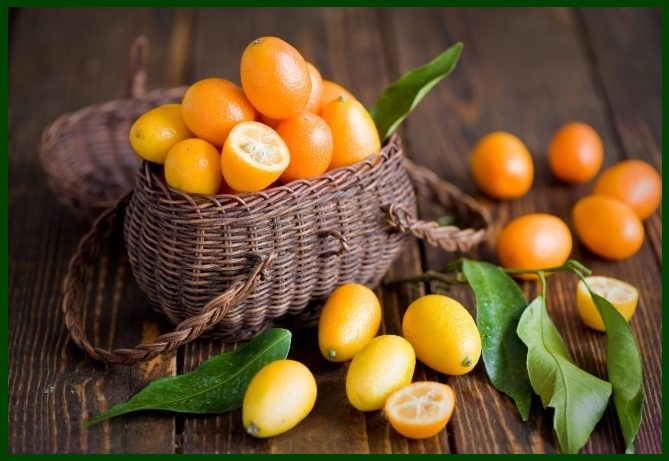 The earliest historical reference to kumquats appears in literature from 12th century China. Kumquats have long been cultivated in India, Japan, Taiwan, the Philippines, and Southeast Asia. 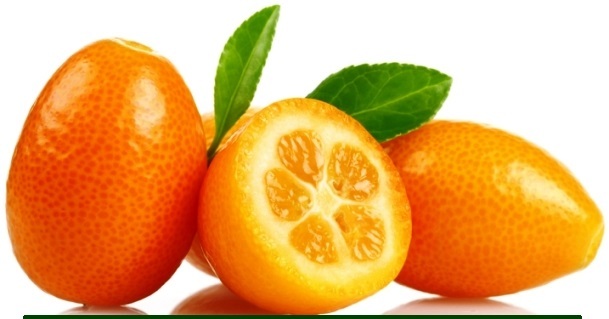 The name ‘kumquat’ is of Chinese origin, and it has the literal meaning of “golden orange”. 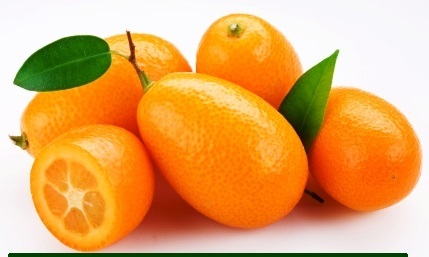 Kumquats are a small citrus fruit that look like baby oranges. Kumquats are slow growing evergreen shrubs or short trees that are 8 to 15 feet tall with dense branches that sometimes have small thorns. 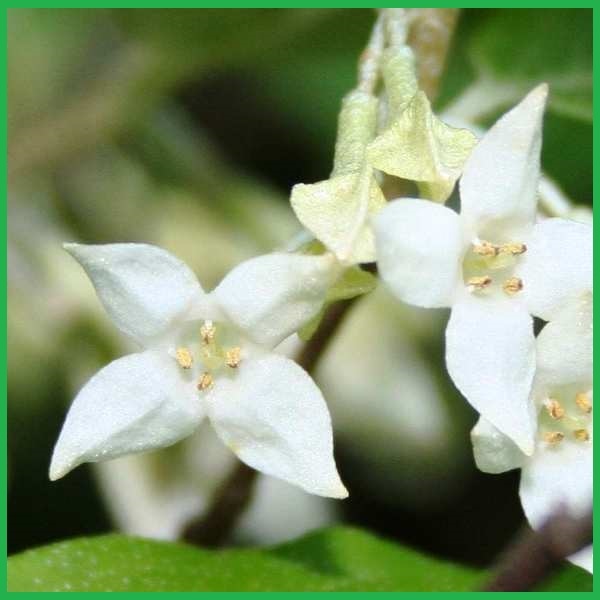 The leaves of kumquat trees are dark glossy green, and the flowers are white, similar to other citrus flowers. 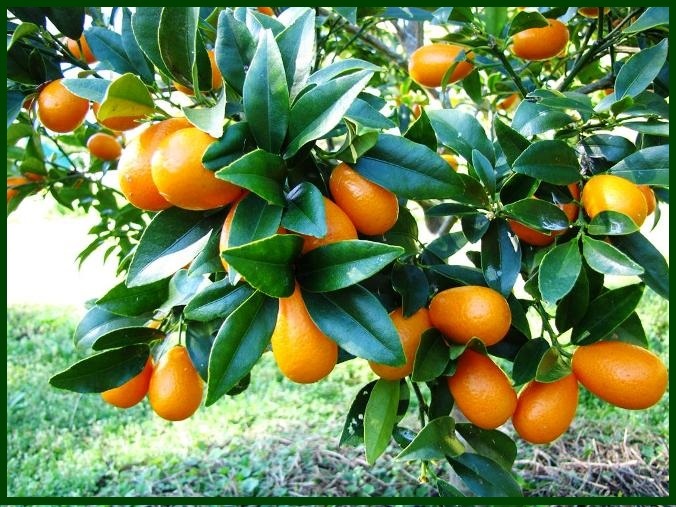 Depending on its size, the kumquat tree can produce hundreds or even thousands of fruits each year. Even when fully ripe, their flavor is still very tart. It is more acidic and less sweet than oranges; which is a key difference between the two. 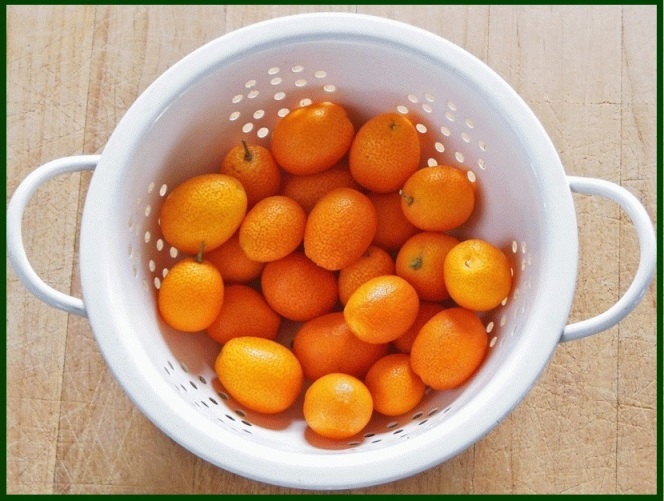 If you should grow your own kumquat tree once it matures it will produce fruit almost all year round. Unlike other citrus fruits, kumquat trees can survive reasonably cold weather. Like most citrus fruits, the predominant health reason to eat kumquats is that they are a good source of vitamin- C. It also contains Manganese, Calcium, Vitamin-A, Vitamin-B complex, Iron, Magnesium, Potassium, Copper, Folate, Zinc,Vitamin-E and their peel is high in polyphenols also. Don’t forget to eat the kumquat peel as well, since it’s particularly rich in antioxidants and fiber, as well as essential oils like limonene, pinene, a-bergamotene, caryophyllene, a-humulene and a-muurolene. All these nutrients play a vital role in developing some of the health benefits that kumquats have. 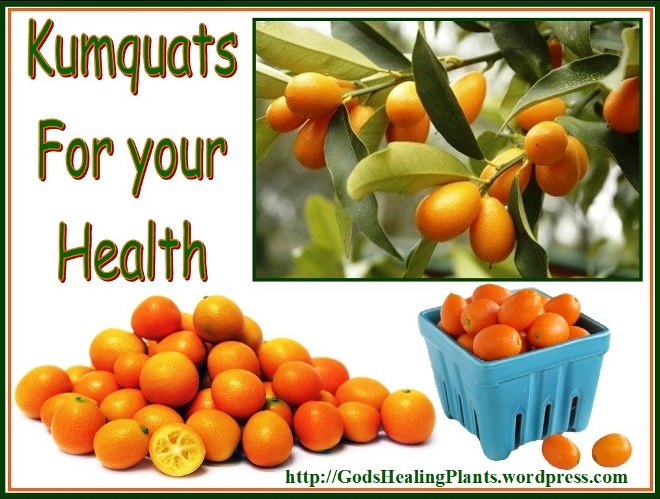 Kumquats are generally available between the end of January and beginning of April. Look for them at farmers markets and specialty stores. You should choose kumquats with bright, smooth skins that feel a bit heavy for their size. Avoid kumquats with bruises, cuts, or blemishes of any kind. Unless you know where they came from, it would be wise to look for certified organic kumquats so you know they weren’t been sprayed with harmful pesticides. Use or eat kumquats as soon after purchasing as you can. Unlike other citrus fruits, kumquats don’t have a long shelf life. 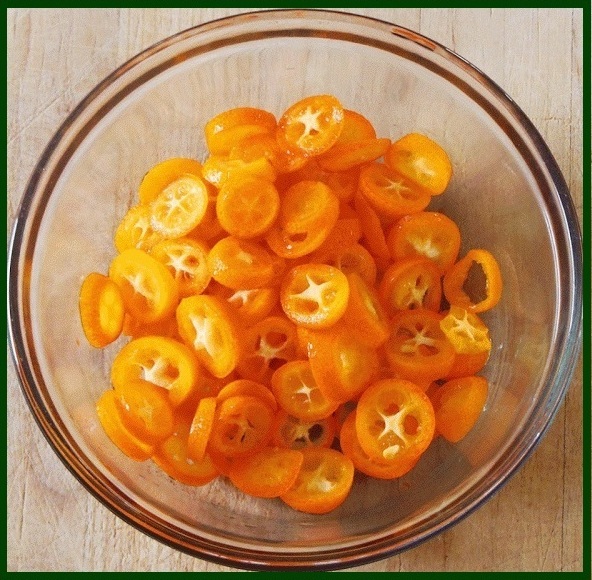 If you do need to store them for a few days, keep kumquats in a paper bag or loosely wrapped in plastic in the fridge. 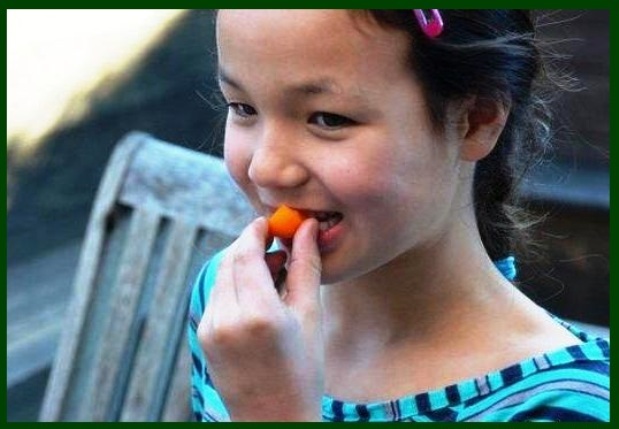 Kumquats are great to eat just as they are, skin and all. 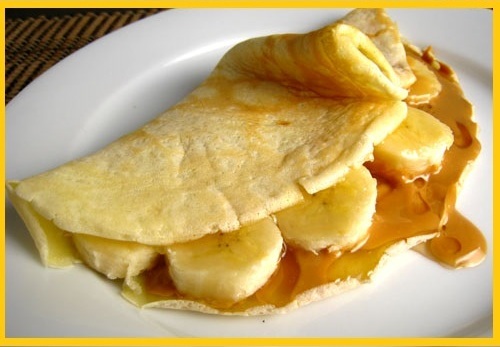 The peel is actually a bit sweeter than the pulp, so eating them whole gives them a balanced flavor. 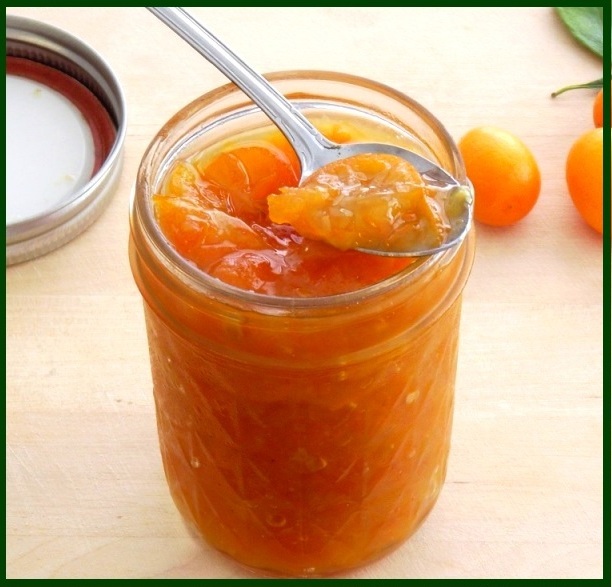 Kumquat jelly is tart but delicious especially if you mix them with oranges. You can add them to fruit or regular salad. 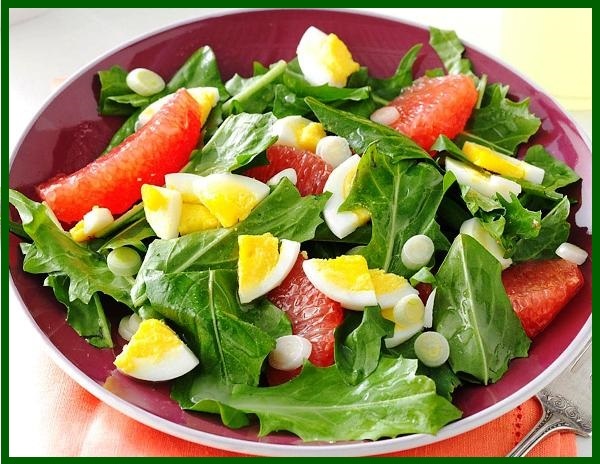 The sour tang of kumquats works great with many of the greens available in winter, especially endive and spinach. 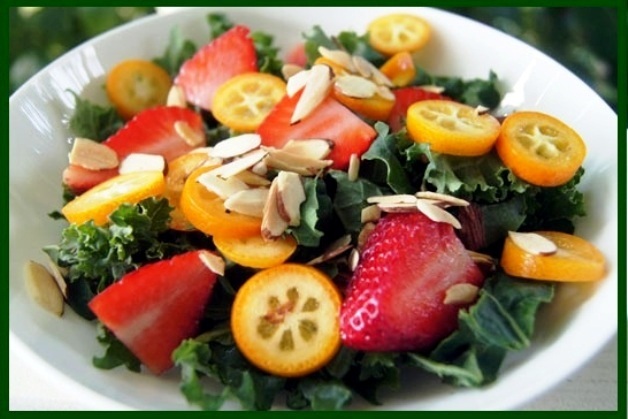 Chop, or thinly slice the kumquats before adding them to the salad. You can add them to a chicken dish. 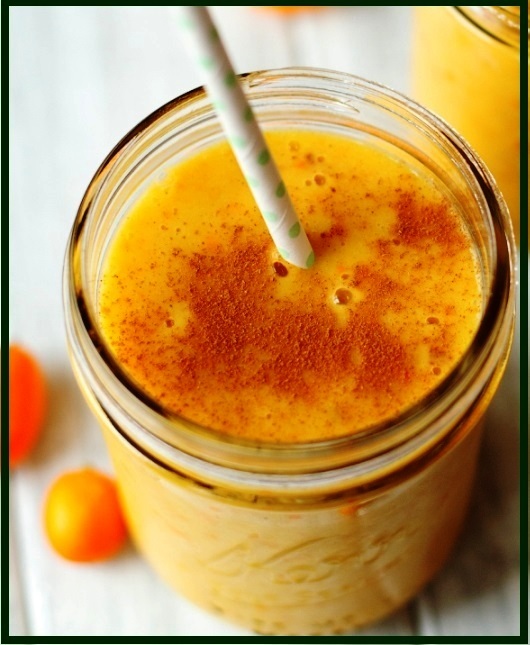 You can even blend them into a smoothie with mangoes for a very delicious taste. No matter how you use kumquats, make sure you give them a good rinse, or even a scrub, to make sure they’re clean before you start popping them in your mouth! Heat pan with butter and cook the onion and then add ground turkey or your favorite beans with your preferred spices until fully cooked. Add the spinach at the end to lightly cook it. Continue with avocado, cheese, and salsa of your choosing. 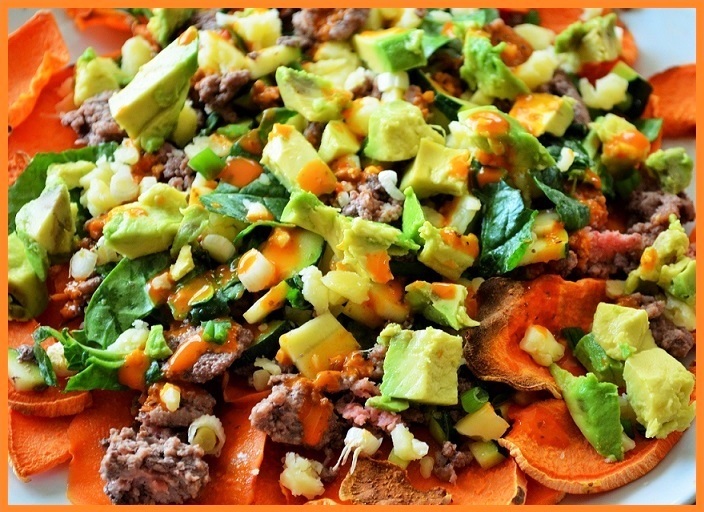 Many people love corn and white potato chips but it is recommended to stay away from those for a variety of reasons. 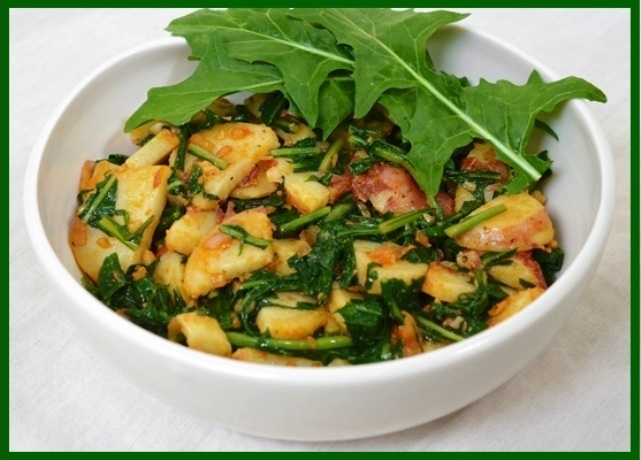 Corn and potato are both very starchy and high glycemic and impact blood sugar, cause insulin surges that increase inflammation throughout the body. These foods are like gasoline on a fire…they burn us up on the inside. Additionally, most store-bought chips (even organic ones) use vegetable oils such as corn oil, soybean oil, cottonseed oil, peanut oil, sunflower oil, grapeseed oil, etc. These oils are high in omega 6 fatty acids and are extremely inflammatory for the body as well. 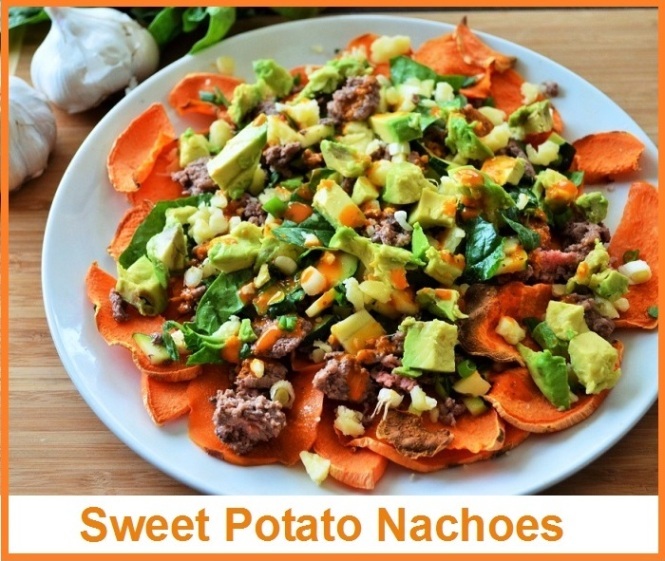 Sweet potatoes are a MUCH better option when it comes to making your own chips. 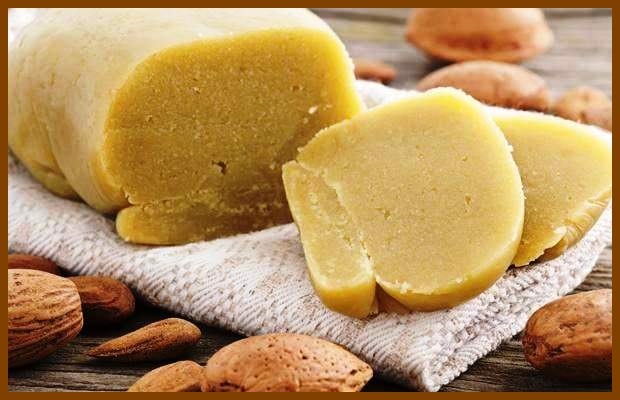 Using organic butter or coconut oil is a significantly healthier choice. 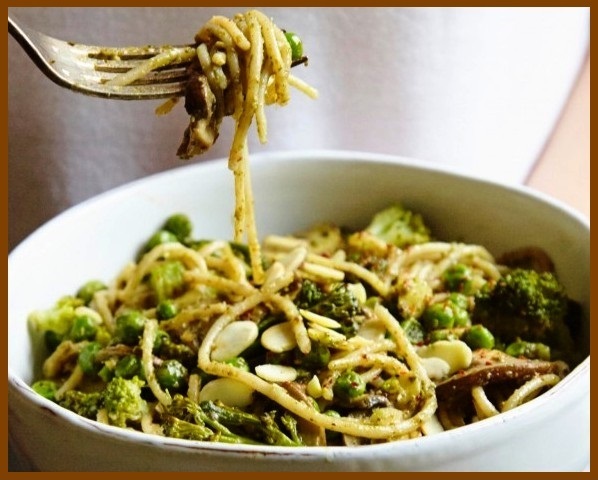 Adding in anti-oxidant rich herbs and veggies makes this a fun, super delicious and nutrient dish! 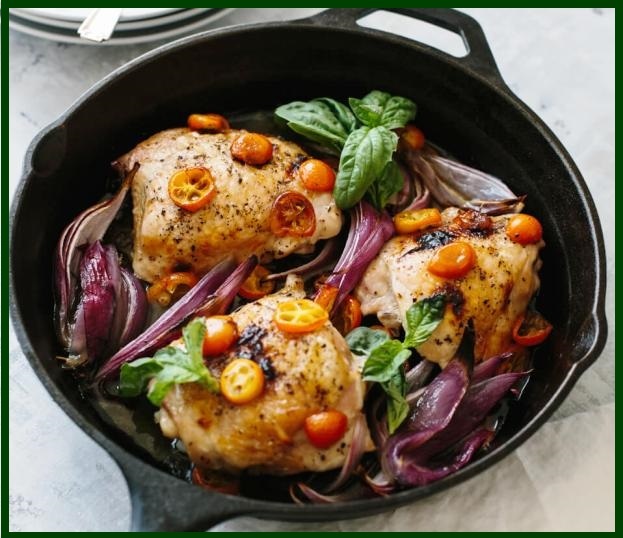 This recipe is a slightly modified version from Megan Kelly. She has is a Licensed Esthetician specializing in holistic nutrition. The wild beet, the ancestor of the beet with which we are familiar today, is thought to have originated in North Africa and grew wild along Asian and European seashores. 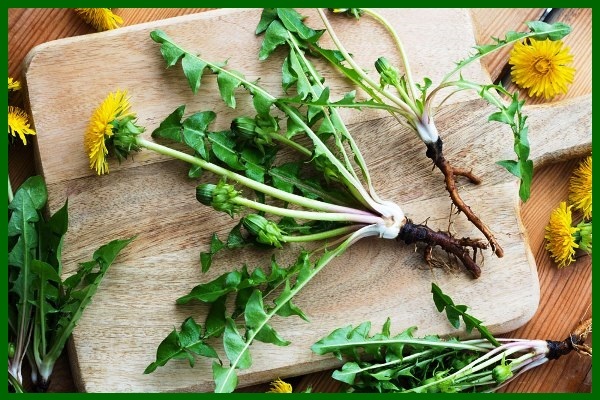 In these earlier times, people exclusively ate the beet greens and not the roots. 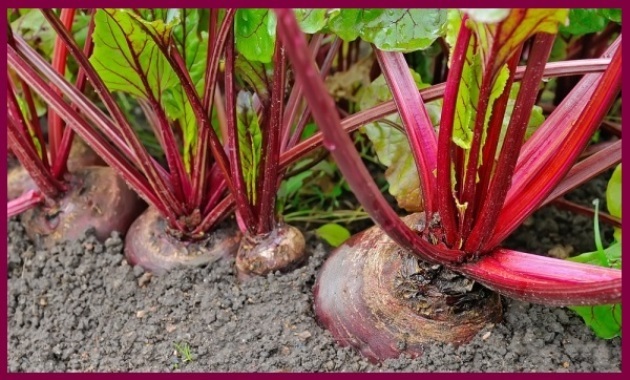 The ancient Romans were one of the first civilizations to cultivate beets to use their roots as food. 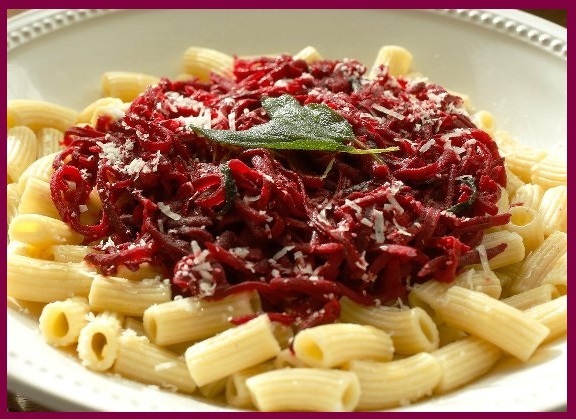 The tribes that invaded Rome were responsible for spreading beets throughout northern Europe where they were first used for animal fodder and later for human consumption, becoming more popular in the 16th century. 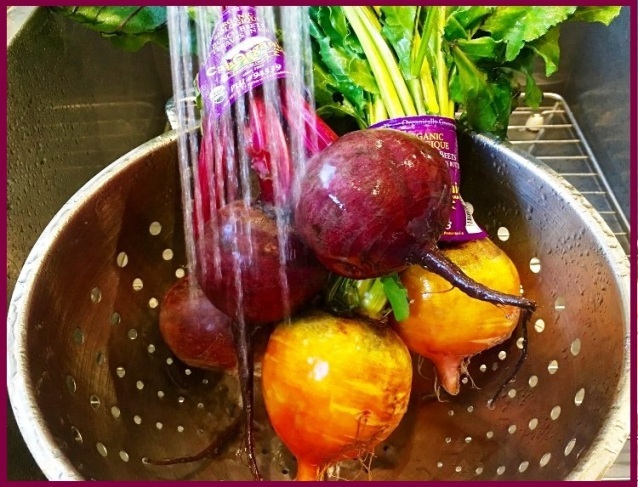 From the 16th to the 19th century, beets became more widespread and used in various ways; for example, their juices were used as food dyes while their sugars quickly became noticed for a source of concentrated sweetness. 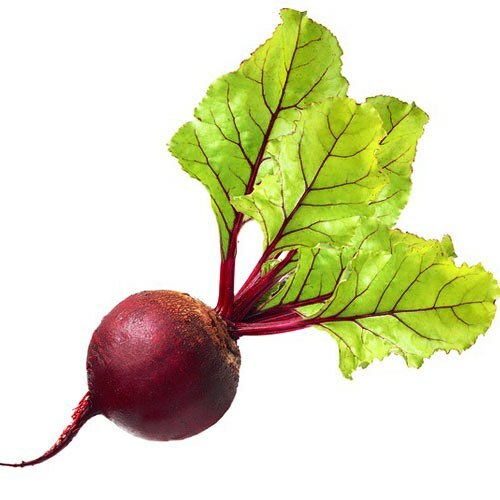 Around the 19th century, beets began being used as a means for extracting and refining sugar. This continued to be a popular method for making sugar throughout Europe, eventually spreading to the United States where beets are still used in this way. 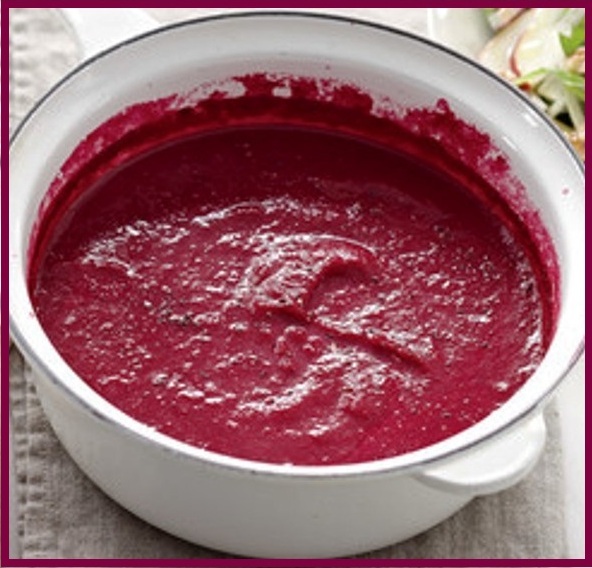 Today the largest producers of beets are the United States, Russia and European nations, such as France, Poland and Germany. 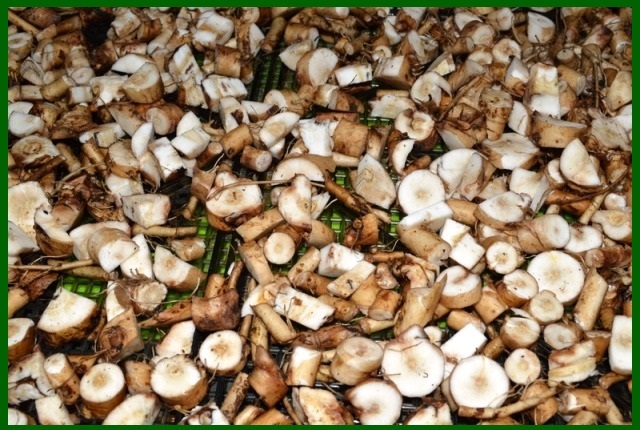 Sugar beets grow exclusively in the temperate zone, in contrast to sugarcane, which grows exclusively in the tropical and subtropical zones. The average weight of sugar beet ranges between 0.5 and 1 kg (1.1 and 2.2 lb). Sugar beet foliage has a rich, brilliant green color and grows to a height of about 35 cm (14 in). The leaves are numerous and broad and grow in a tuft from the crown of the beet, which is usually level with, or just above the ground surface. 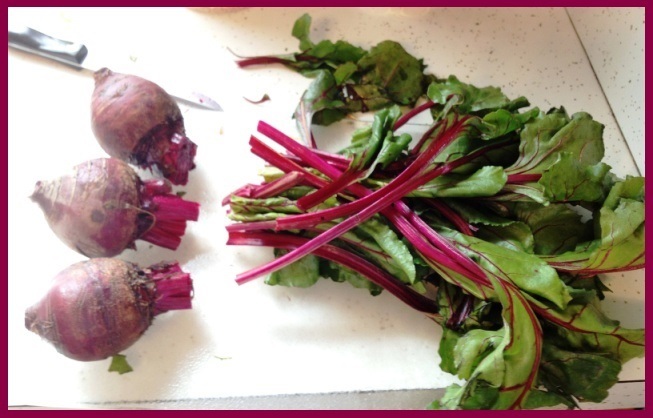 Beets are an excellent source of folate and a very good source of manganese, potassium and copper. 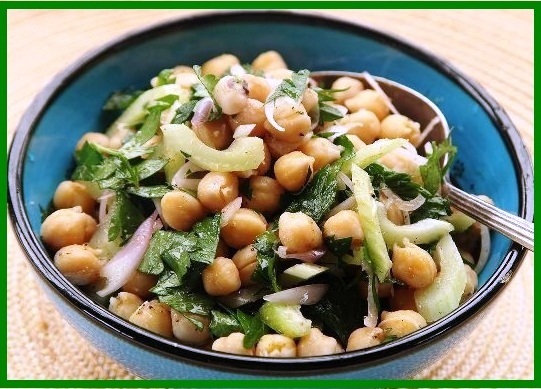 They are also a good source of dietary fiber, magnesium, phosphorus, vitamin C, iron and vitamin B6. 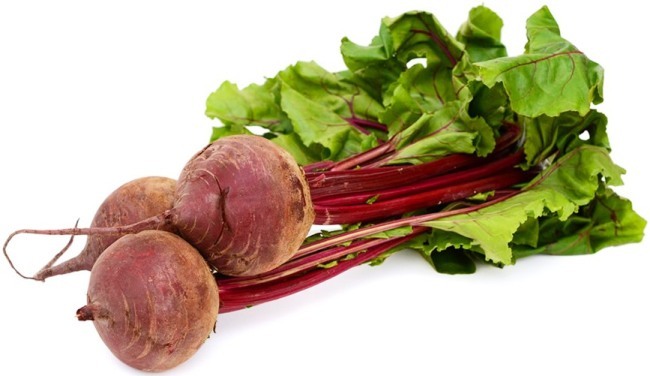 Although beets have the highest sugar content of all vegetables, most people can safely eat beet roots a few times a week, enjoying not only their sweet, earthy flavor but also their powerhouse nutrients that may improve your health in the following ways. 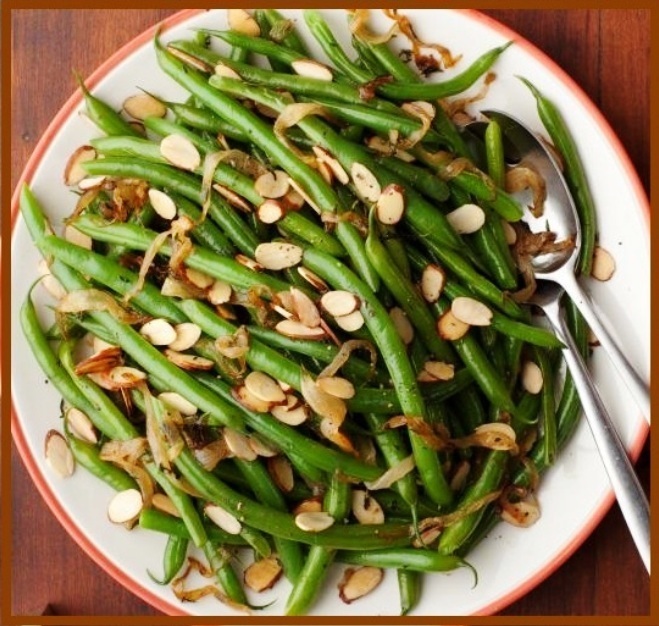 Their greens can be eaten in unlimited quantities. We need to eat the beet greens also. 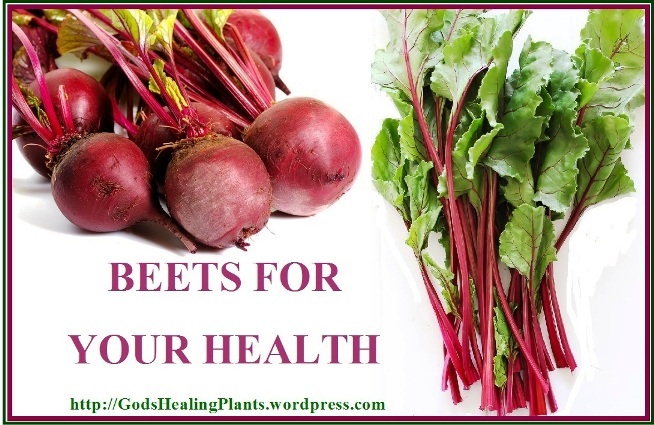 If you simply throw away the green leafy tops to your beets, you’re doing yourself a disservice, as these are among the healthiest part of the plant. 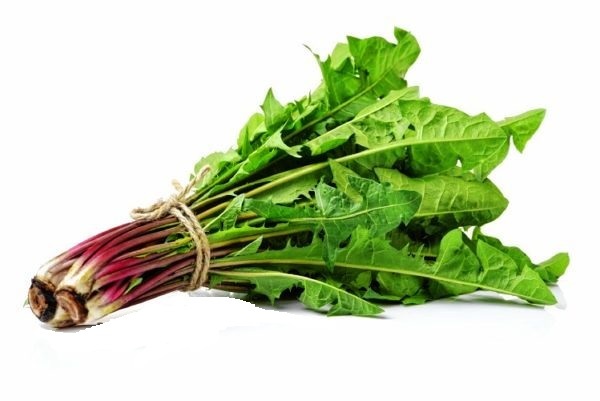 Besides containing important nutrients like protein, phosphorus, zinc, fiber, vitamin B6, magnesium, potassium, copper, and manganese, beet greens also supply significant amounts of vitamin A, vitamin C, calcium, and iron. 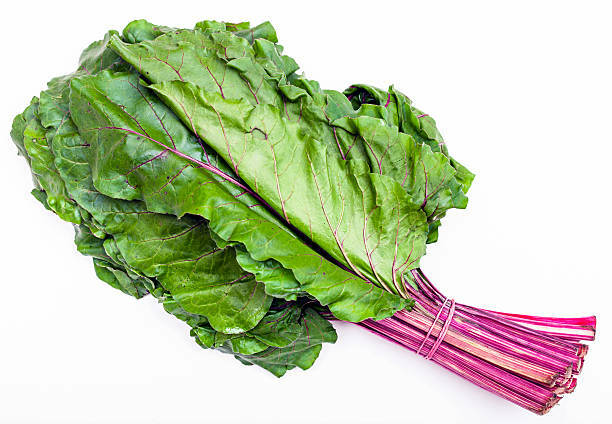 And beet greens actually have even more iron than spinach. Strengthen your immune system by stimulating the production of antibodies and white blood cells. 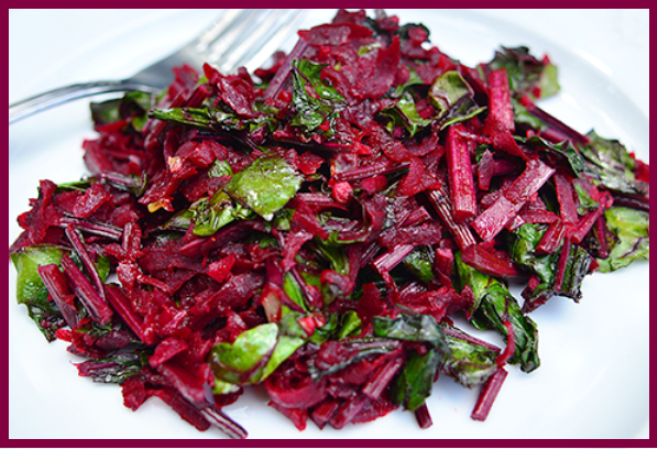 If you’ve never tried beet greens before, don’t let them intimidate you. 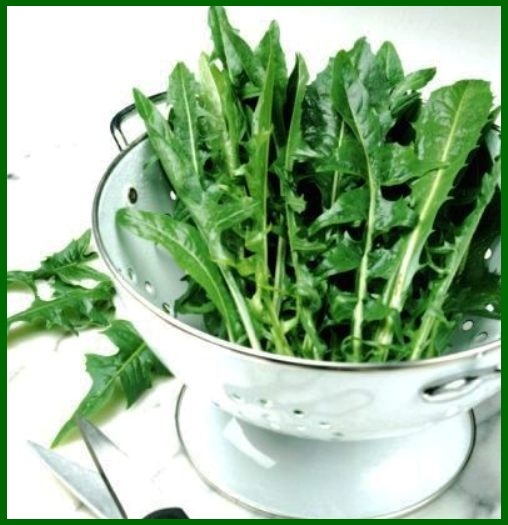 They can be added raw to vegetable juice or sautéed lightly right along with other greens like spinach and Swiss chard. 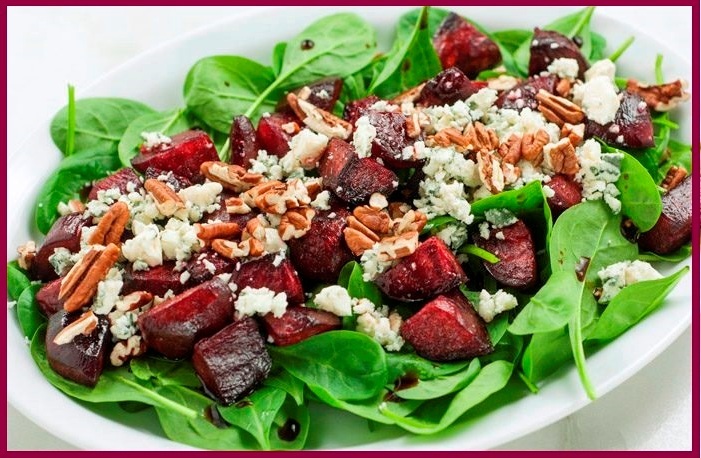 Choose small or medium-sized beets whose roots are firm, smooth-skinned and deep in color. 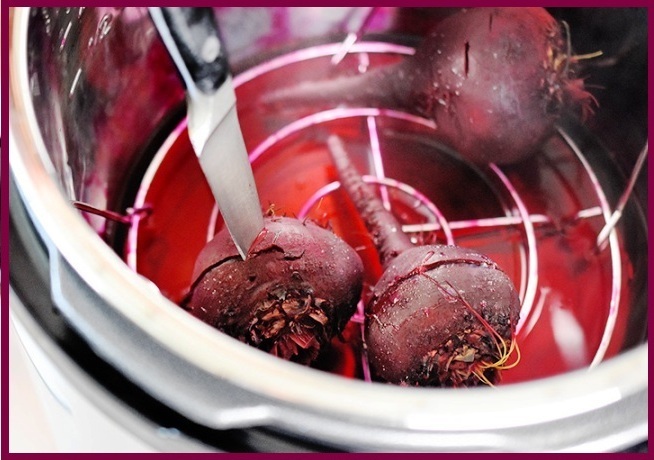 Smaller, younger beets may be so tender that peeling won’t be needed after they are cooked. 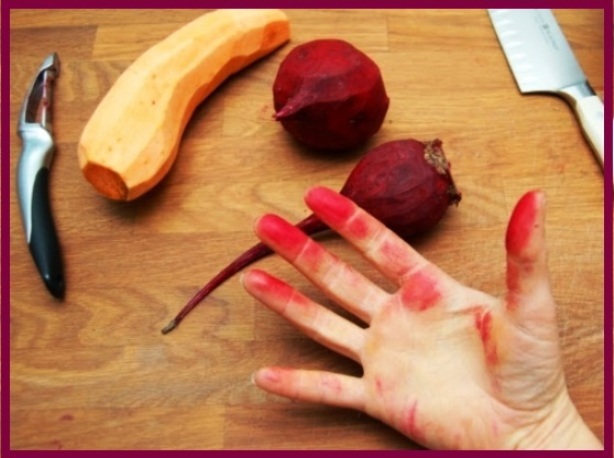 Avoid beets that have spots, bruises or soft, wet areas, all of which indicate spoilage. Shriveled or soft should also be avoided as these are signs that the roots are aged, tough and fibrous. 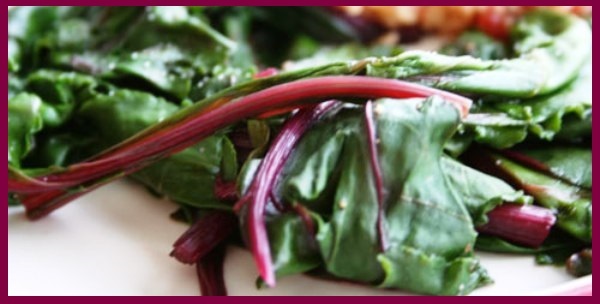 Boil beet greens for 1 minute and toss it with your favorite dressing for a great tasting side dish. 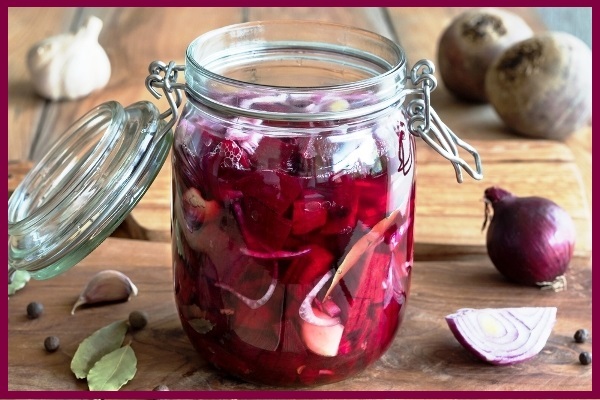 Canning beets in fresh lemon juice, extra virgin olive oil, onions and fresh herbs, can be enjoyed year round. 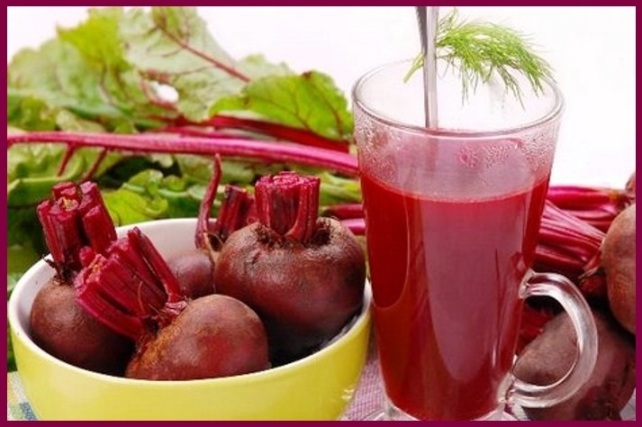 Beet juice is delicious by itself, but you can add any favorite vegetable to it. 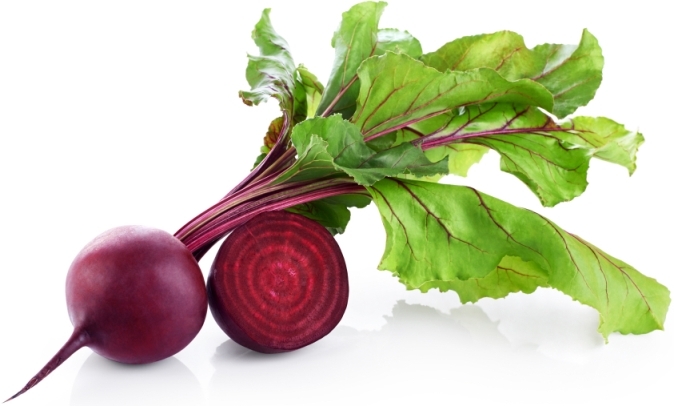 Beets have consistently been determined to have high oxalate content. Oxalates are naturally occurring organic acids found in a wide variety of foods, and in the case of certain medical conditions, they must be greatly restricted in a meal plan to prevent over-accumulation inside the body. 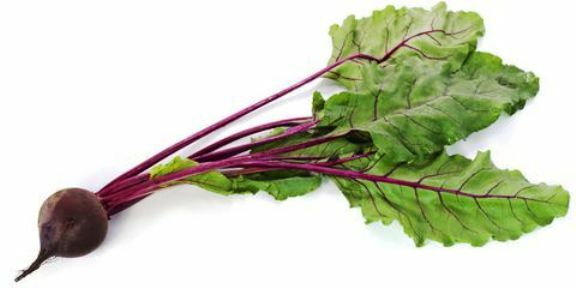 Although there are numerous potential beet benefits, there are some people who may need to moderate their intake. 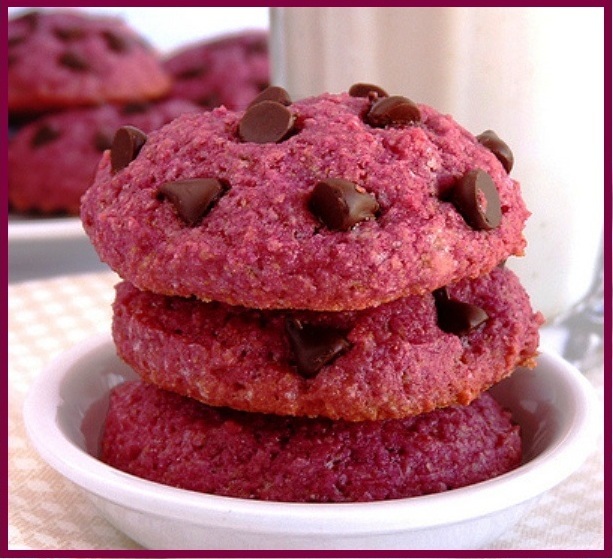 While rare, some people may be allergic to beets. If you experience any food allergy symptoms like hives, itching or swelling, discontinue use immediately and talk to your doctor. Augustsson K, Michaud DS, Rimm EB, et al. A prospective study of intake of fish and marine fatty acids and prostate cancer. Cancer Epidemiol Biomarkers Prev. 2003 May;12(1)64-7. 2003. PMID:12540506. 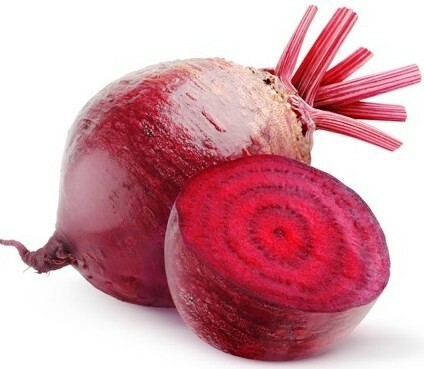 Bobek P, Galbavy S, Mariassyova M. The effect of red beet (Beta vulgaris var. rubra) fiber on alimentary hypercholesterolemia and chemically induced colon carcinogenesis in rats. Nahrung 2000 Jun;44(3):184-7. 2000. Elbandy MA and Abdelfadeil MG. 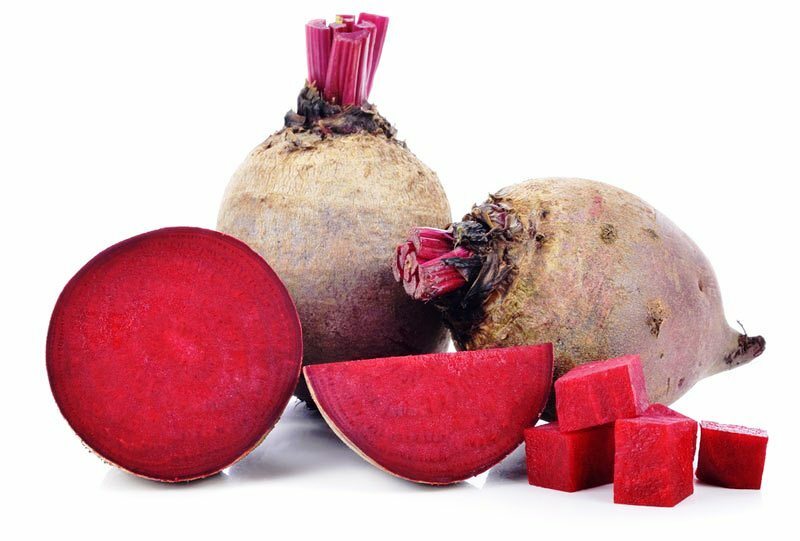 Stability of betalain pigments from a red beetroot (Beta vulgaris). Poster Session Presentation. The First International Conference of Food Industries and Biotechnology & Associated Fair. Al-Baath University, North Sinai, Egypt. Lucarini M, Lanzi S, D’Evoli L et al. 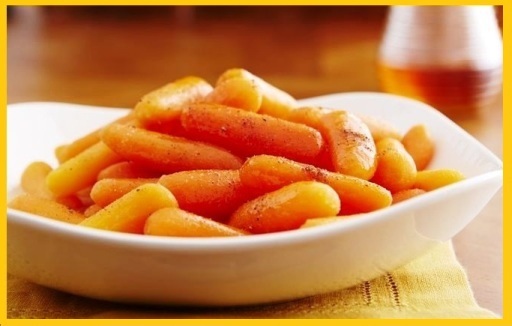 Intake of vitamin A and carotenoids from the Italian population–results of an Italian total diet study. Int J Vitam Nutr Res. 2006 May;76(3):103-9. 2006. Reddy MK, Alexander-Lindo RL and Nair MG. Relative inhibition of lipid peroxidation, cyclooxygenase enzymes, and human tumor cell proliferation by natural food colors. J Agric Food Chem. 2005 Nov 16;53(23):9268-73. 2005. Renner-Nance J. Improving the stability and performance of naturally derived color additives. DD Williamson Support Center Presentation, Louisville, KY, June 8, 2009. Exactly how long honey has been in existence is hard to say because it has been around since as far as we can record. Humans have eaten it, bathed in it, took care of their wounds with it and have traded it since the beginning of history. Archaeologists discovered honey comb in Egypt that had been buried with the pharaohs in their tombs, the honey was preserved and was still eatable. 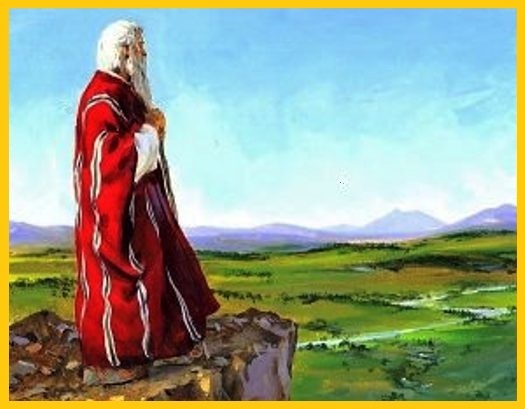 In the Old Testament, the land of Israel was often referred to as the “land flowing with milk and honey”. God promised Moses to take them out of Egypt and into a land flowing with milk and honey. John the Baptist ate locusts and wild honey. And the Bible states: eat honey because it is good for you – Proverbs 24:13. The Greeks viewed honey as not only an important food, but also as a healing medicine, and the Romans did the same and used honey to heal their wounds after battles. 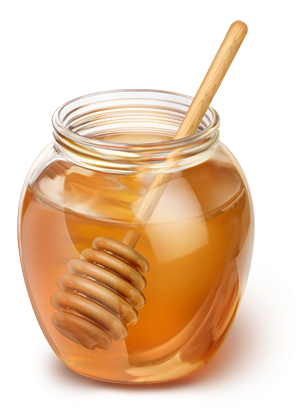 Honey has been used for many thousands of years; in fact most of history has references to it. It is an organic natural sugar, has no additives, is easy on the stomach, and if stored correctly will have an almost indefinite shelf life. 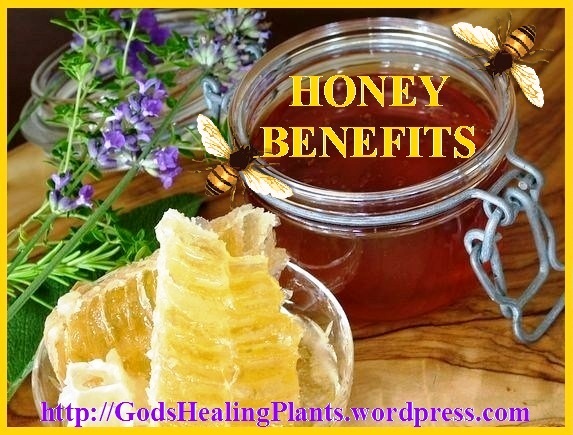 Raw honey comes from the flowers of plants and herbs that God created for us. 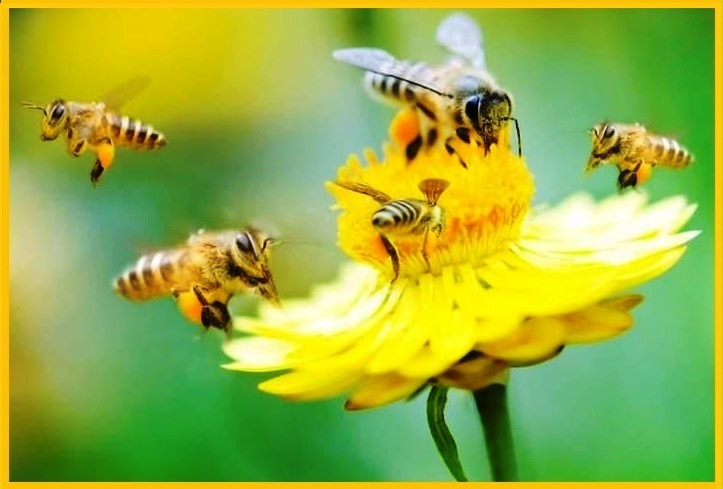 It is the concentrated nectar of flowers that comes straight from the extracting bee. It is an alkaline-forming food, containing ingredients similar to those found in fruits, which become alkaline in the digestive system. It doesn’t ferment in the stomach and it can be used to counteract acid indigestion. 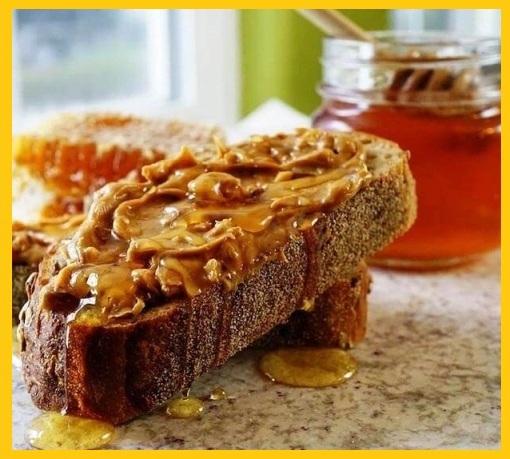 Raw honey is the healthiest choice amongst the various forms of honey as it has the most nutritional value and contains amylase, an enzyme concentrated in flower pollen which helps predigest starchy foods like breads. Amino acids – Raw honey contains approximately 18 essential and non-essential amino acids, the building blocks of protein. These include cysteine, histidine, glutamine, lysine, proline, and tryptophan. Antioxidants – Honey contains many of the antioxidants found in green leafy vegetables, particularly flavonoids that help boost healthy balance, increase your energy, support enzyme activity, and soothe your skin. 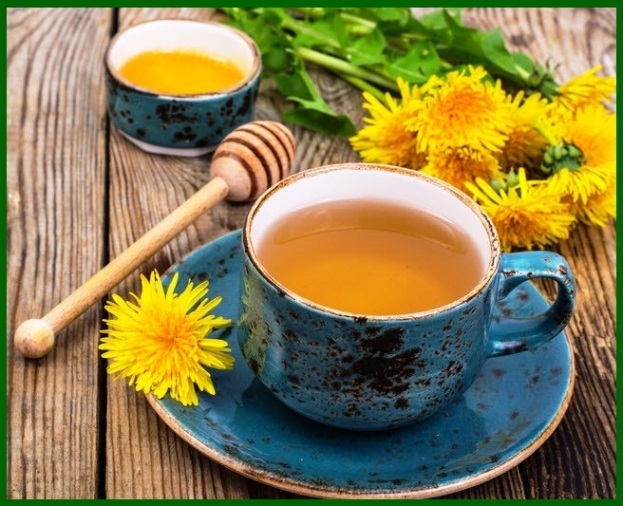 Enzymes – Raw honey contains acid phosphatase, catalase, diastase, invertase, inulase, and glucose oxidase, which support digestion and assimilation. Minerals – Honey’s mineral profile features calcium, chromium, copper, iron, magnesium, manganese, phosphorous, potassium, selenium, and zinc. Selenium is a mineral antioxidant that helps support your cardiovascular and immune systems. Nutraceuticals – These important nutrients help enhance your immune system and provide you benefits that go beyond those involved in normal metabolic activity. Vitamins – Honey is a good source of vitamin C (an antioxidant) and B vitamins, particularly niacin (vitamin B3), riboflavin (vitamin B2), and pantothenic acid (vitamin B5), which help boost your energy. Raw honey also helps promote the growth of probiotics or beneficial bacteria in your gastrointestinal tract. 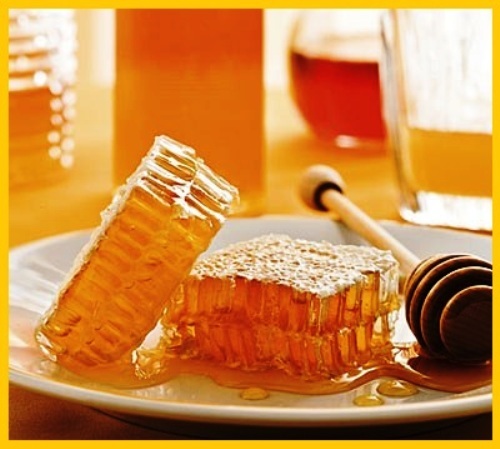 For centuries, honey has been used to treat all sorts of ailments. It can be applied topically to heal wounds and rashes, or it can be taken internally to treat infections and address other health concerns. Although there are numerous applications of raw honey, the following are the most popular for common everyday conditions. Allergies: To treat allergies, take a teaspoon of locally harvested raw honey a couple of times a day starting a few months prior to allergy season. 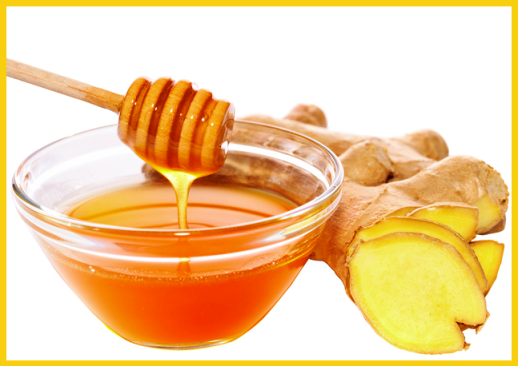 Antibiotic: Raw honey’s antibiotic properties are effective in treating colds and sore throats. 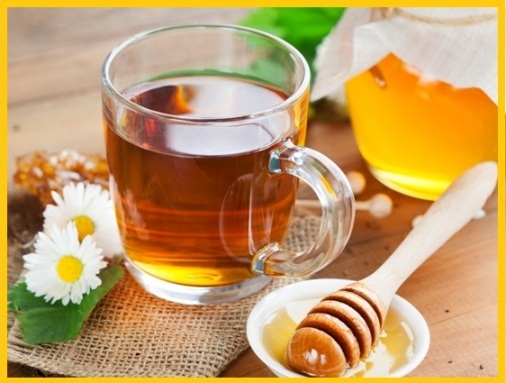 Raw honey coats the throat and reduces irritation. For blocked sinuses, mix a teaspoon of honey in a pot of hot water, put a towel over your head, and just inhale the steam. Dandruff Treatment: Honey mixed with warm water and applied to the scalp for 15 to 30 minutes and then rinsed, has been shown to stop the scalp from itching and flaking. Energy Boost: As and energy boost honey being a source of unprocessed sugar, lets the body directly absorb fructose and glucose. This will give you a healthy quick burst of energy whenever you need it. Memory Boost: Filled with antioxidants, honey helps protect brain cells from being damaged, keeping your brain sharp and your memory great. Honey also aids in the body’s absorption of calcium, which is needed by the body in decision-making and processing thought. Nausea Relive: When mixed with ginger and lemon juices, it also relieves nausea. Wound and Burn Treatment: For skin burns, rashes, and abrasions, place a honey poultice over the affected area. Sleeping Aid: Honey has properties that promote the release of serotonin, which is then converted to melatonin, the hormone responsible for a good night’s sleep. 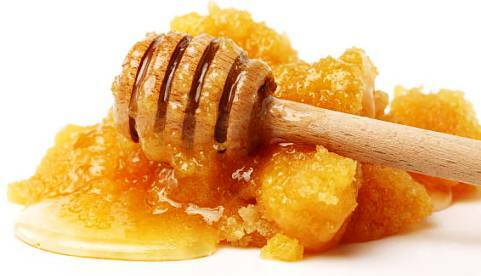 Washing your face with honey will leave you with sparkling, clean, soft skin. Start by rinsing your face and removing any sweat and dirt accumulated during the night. 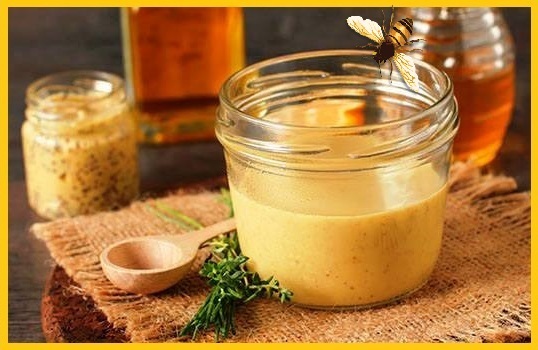 With your face slightly damp, the honey will be easier to spread and will go on smoother and be less sticky. Take a teaspoonful of honey and gently massage it into your face, using a soft sponge if you prefer. If you’re dealing with a breakout or skin dryness, let the honey sit on your face for five to ten minutes to allow your skin to absorb all of its good properties. Finally, using water, your hands, a washcloth or sponge, rinse the honey off your face. 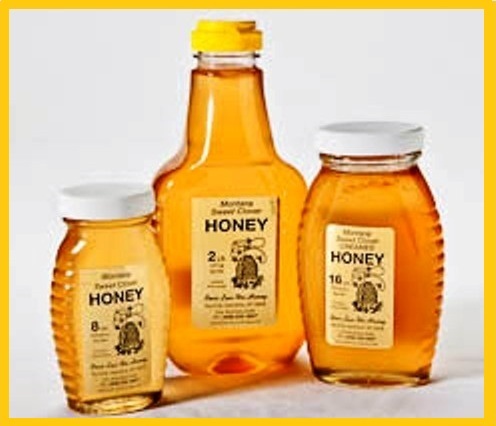 Most of the honey found in the supermarket is not raw honey but “commercial” regular honey, which has been pasteurized (heated at 70C or 158F degrees or more, followed by rapid cooling) and filtered so that it looks cleaner and smoother, more appealing on the shelf, and easier to handle and package. 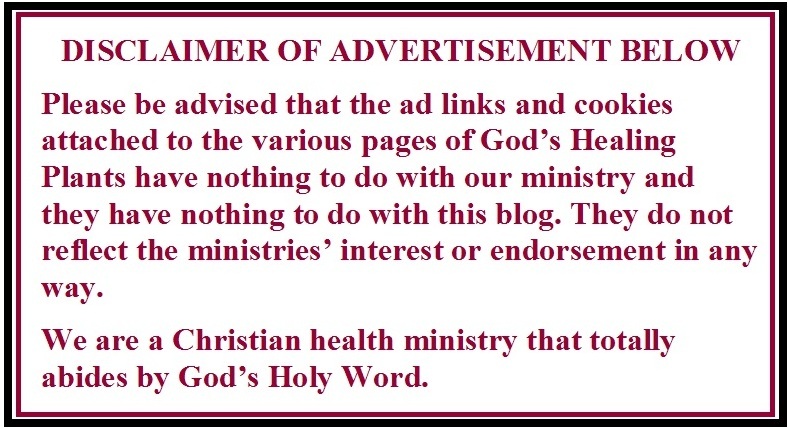 Unfortunately many have additional additives that are not good for your health. Pasteurization kills any yeast cell in the honey and prevents fermentation. It also slows down the speed of crystallization in liquid honey. 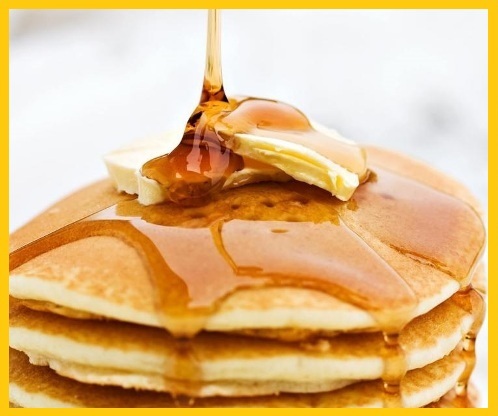 On the downside, when honey is heated, its delicate aromas, yeast and enzymes which are responsible for activating vitamins and minerals in the body system are partially destroyed. 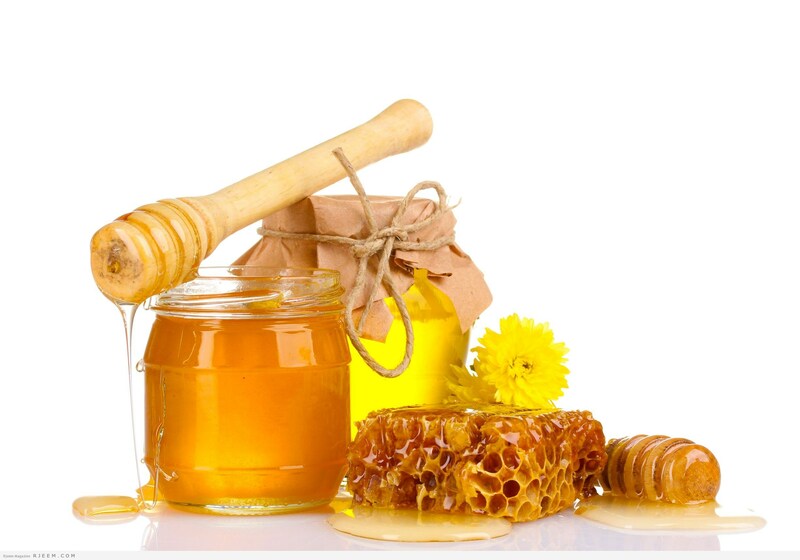 Hence, raw honey is a far better choice than honey that has undergone heat treatment. Among manufacturers there exists no uniform code of using the term “raw honey”. There are no strict legal requirements for claiming and labeling honey as “raw”. You may also find raw honey that is unprocessed but slightly warmed to retard granulation for a short period of time and allow light straining and packing into containers for sale. Using as little heat as possible is a sign of careful handling. Comb honey is raw pure honey sections taken straight from the hive – honey bees’ wax comb with no further handling at all. It is the most pure form in which honey comes — the bees fill the hexagon shaped wax cells of the comb with honey and cap it with beeswax. You can eat comb honey just like a chewy candy. Because the honey in the comb is untouched and is deemed to be pure, honey presented in this form comes with a relatively higher price tag, but never the less it is the best for your health. 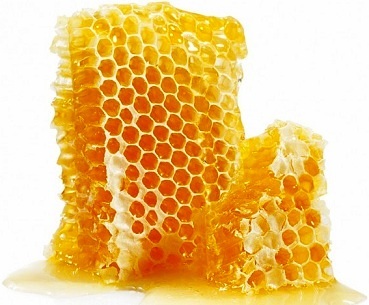 All honey types, except comb honey, are processed to some extent. 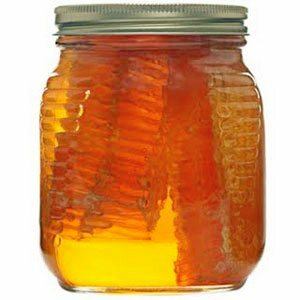 Less processed honeys (no heat applied) have more taste but can be susceptible to fermentation from sugar tolerant yeasts which are always present in honey. High temperatures, over 160 degrees used during processing with filtration, tend to reduce granulation and help improve the looks of the products; however, natural enzymes are eliminated. Liquid honey needs to be stored in a cool dry area avoiding sunlight with an optimal temperature of 70-80 degrees Fahrenheit. It also should be kept it in a tightly lidded container as honey easily absorbs moisture. 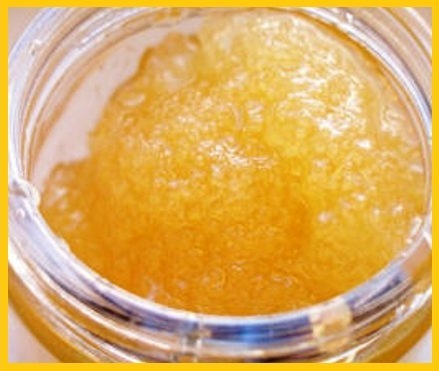 Over time, liquid honey will crystallize (also known as granulating). That is ok. While it might look unpleasant, you can restore honey to its liquid state by simply placing the container in warm water until the crystals disappear and removing it from the heat source as quickly as possible. Never boil your honey because vital nutrients will be lost.